i love food. 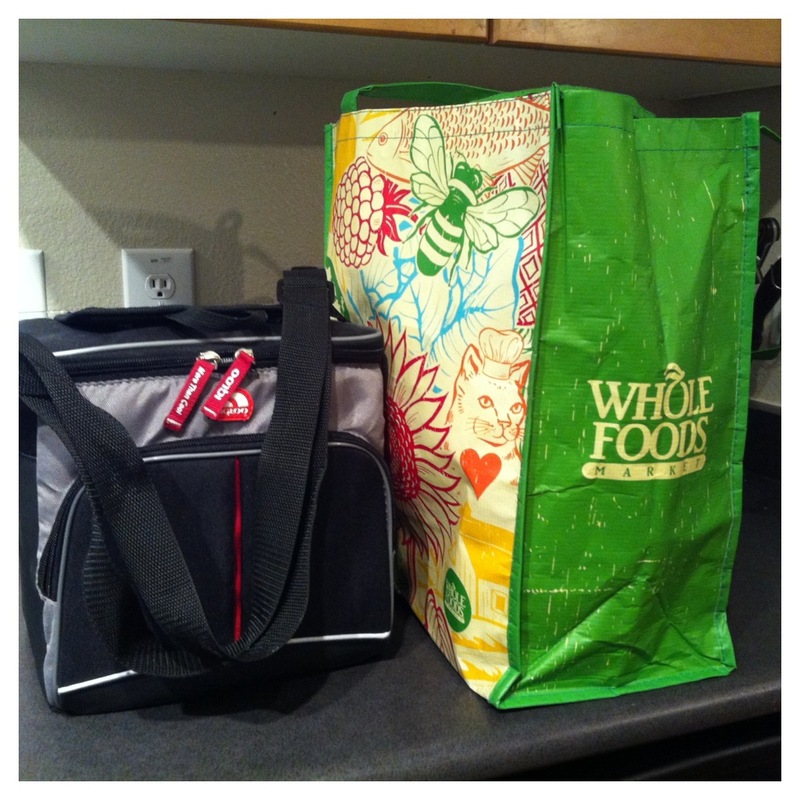 health or junk, fancy or fast. Happy Monday everyone! Hope you all had a great weekend. Last night we grilled chicken out by the lake and built amazing tacos that I simply must share with you all. I’ve done these a few times now, and after bits of modification here and there, they finally taste just right. 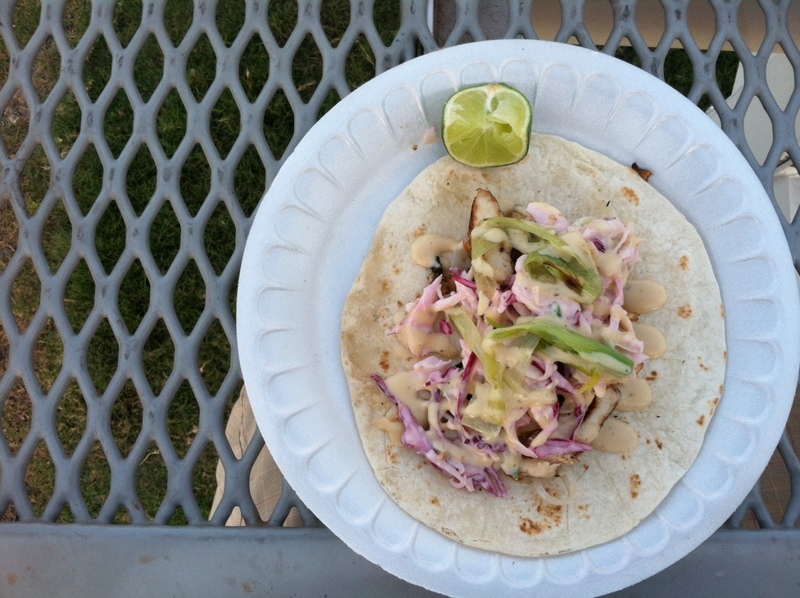 The ultimate balance of all delicious flavors and textures — juicy, super seasoned grilled chicken, crunchy coleslaw with the snap of balmy, nutty sesame seeds, sweet charred onions, and a savory, creamy, complex, homemade dressing to pull it all together in a soft tortilla, plus a squirt of lime juice. I literally dreamt about them last night. This is the ultimate stress-free summer finger food! Start with a few boneless, skinless chicken breasts. I did three big ones and that was plenty for two hungry people plus some leftovers (we’ll see who gets to them first tonight :)). Trim anything gross-looking off, and cut each breast into 3 or so pieces. Now cover with waxed paper and use a meat pounder to gently pound these pieces to about half an inch in thickness. No real rhyme or reason here, they will all come out different shapes. As long as the thickness is about uniform, you’re on the right track! This makes for the most tender chicken. You still have a quarter of that mixture in your blender. Throw in about 2 heaping tablespoons of mayo, and get the blender spinning again. As it’s going, stream in another quarter cup or so of vegetable oil. The mayo will further thicken the sauce, and the additional oil you’re pouring in will follow suit and continue to do the same. 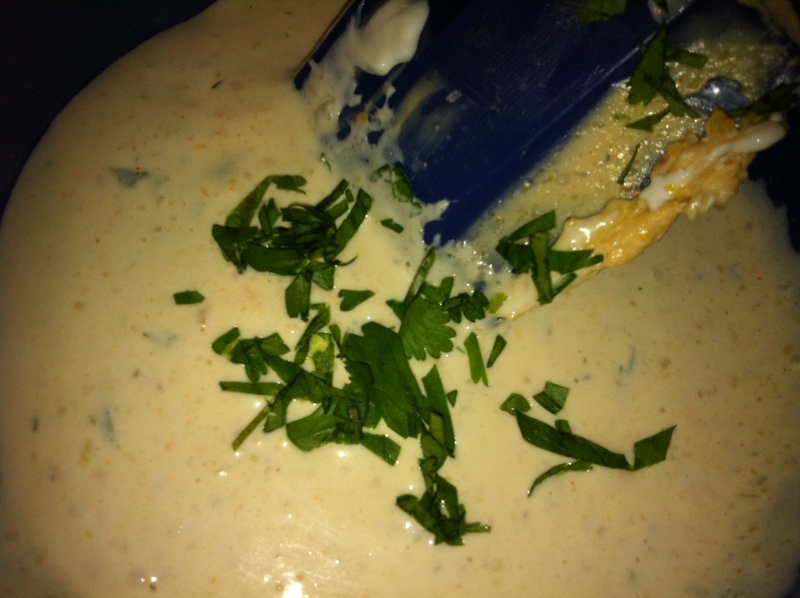 You’ve just made your very own delicious, flavorful, creamy dressing! Give it a taste. Go ahead and adjust for seasoning here, it may need more salt. This by itself would be so delicious over cucumbers and greens, or to dip french fries in, or mixed into canned tuna fish. Very versatile! Creamy dressings are one of my biggest weaknesses. I put the dressing in a squeeze bottle for easy application later, but if you don’t have one, you can keep it in Tupperware and spoon in onto your taco. 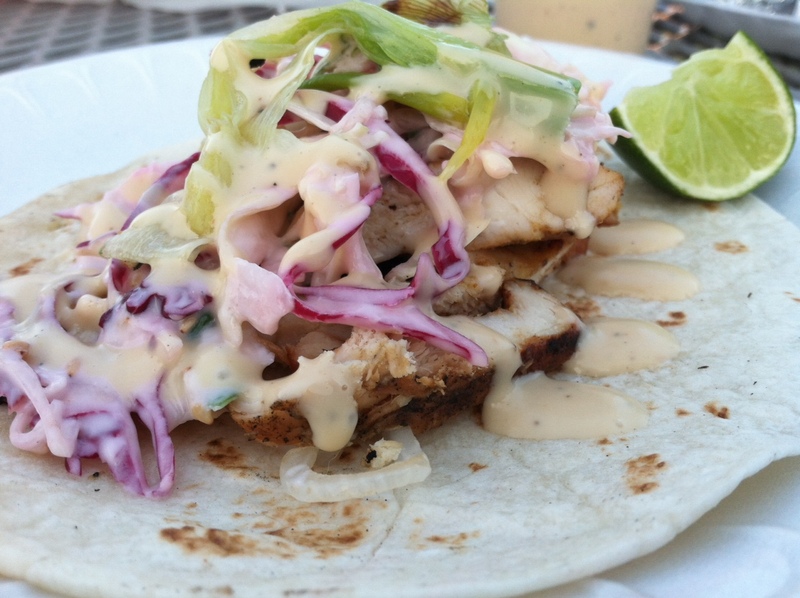 The creamy dressing for these tacos is in the middle. I had a creamy dressing party with myself on Sunday. The left one is creamy garlic balsamic, and the right is creamy lime dill pickle dressing (sounds crazy, and it is — the idea for this one came to me in a dream!). As your chicken’s marinating, the next step is to prepare the slaw. I used red and green cabbage because we had both in the house, but you can also just do one color. I happen to love the red especially, because once it’s dressed and sits a while, the pretty color seeps into the sauce and it all turns out a gorgeous light fuchsia. Sometimes it’s hard to believe colors so vibrant can come from a vegetable. I sliced my cabbage (about a quarter-head of each color) very thinly. 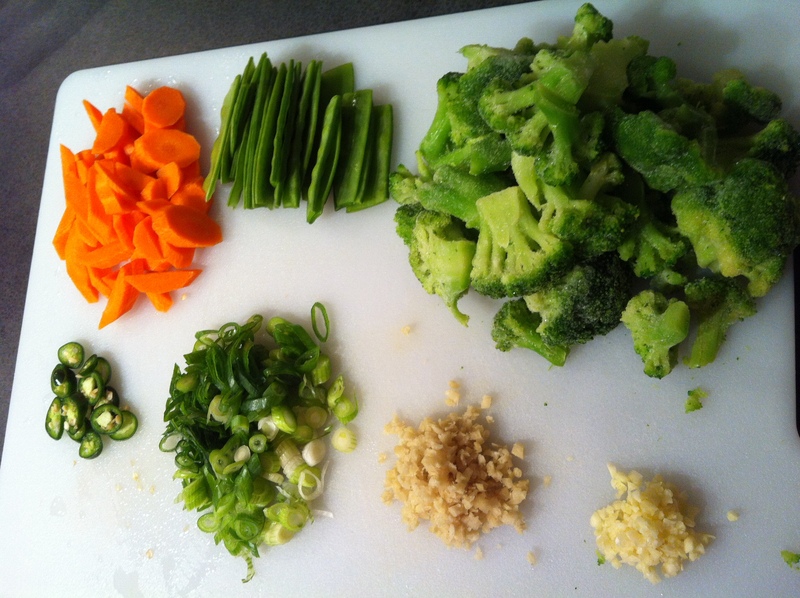 Also slice two scallions thinly and set these veggies aside. In a big bowl, prepare the sauce for your slaw: 2 tbsp. 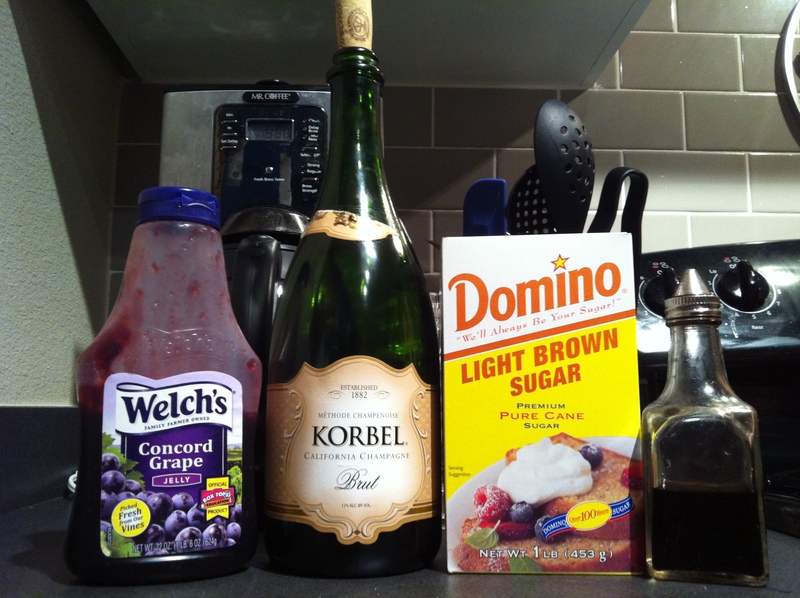 red wine vinegar (or rice vinegar), 1 tbsp. sugar, 1 tsp. salt, black pepper to taste, 3 tbsp. mayo, 2 tbsp. sour cream, and a small handful of sesame seeds. 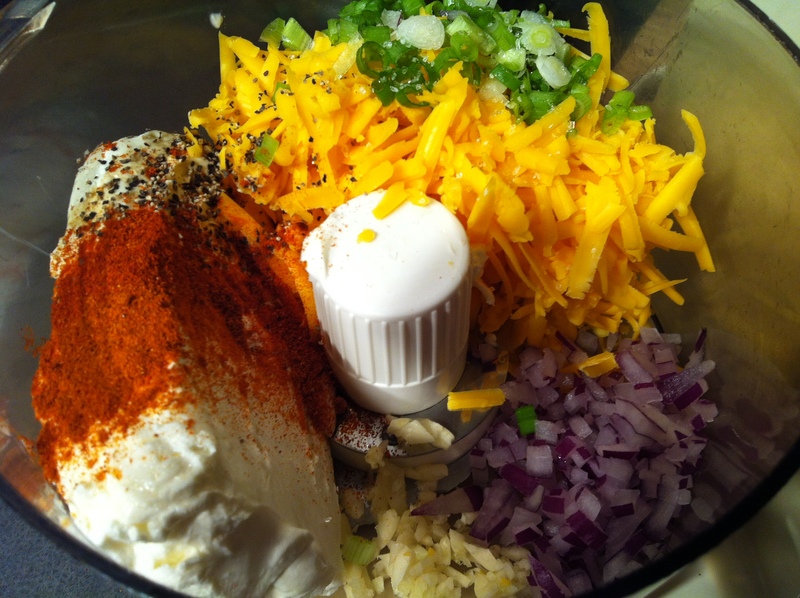 Whisk this all together briskly until everything’s combined into a smooth mixture. Then, dump your cabbage and scallions in and toss with salad tongs until everything’s coated. Done! 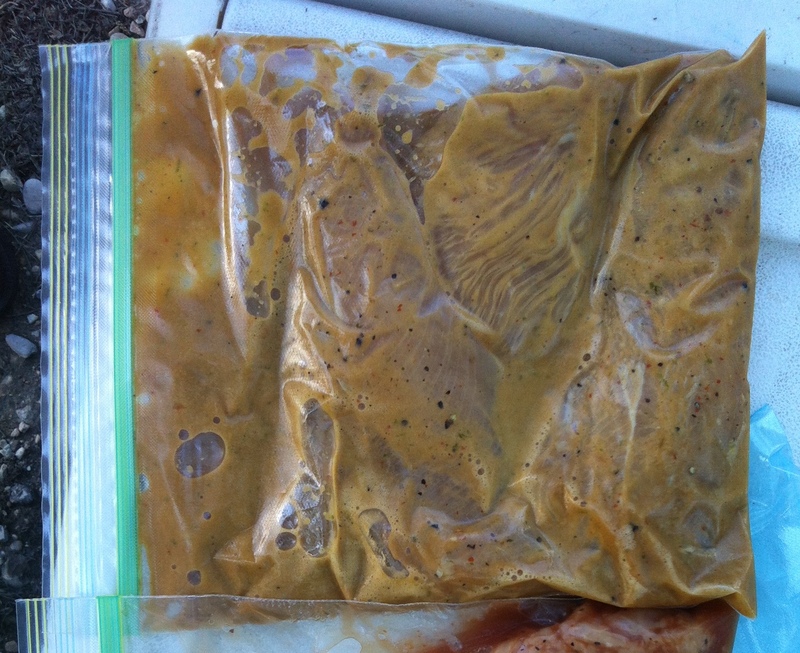 You are now ready to head to the grill (once your chicken’s marinated for your desired length of time). In addition to the chicken, the creamy dressing, and the slaw, you will need: flour tortillas (taco-sized), spring onions, and lime wedges. Spring onions look like mini white onions with a scallion growing out of the top. I believe these are seasonal (hence the name). We had these in Mexico for the first time and fell in love with them. If you can’t find them, I’d recommend using whole scallions instead. Either way will be great, as both will end up with a sweet caramelized onion flavor after charring on the grill. Get your coals hot (or your gas turned on) and warm up the grill until it’s at about medium heat. Throw the chicken on first, and cook about 4-5 minutes on each side. This will vary, as it’s hard to control the temperature of a charcoal grill (at least, it is for me!). You’ll know when it’s done…the chicken will have a great deep amber color on it, even charred in some spots, and it will be firm to the touch. 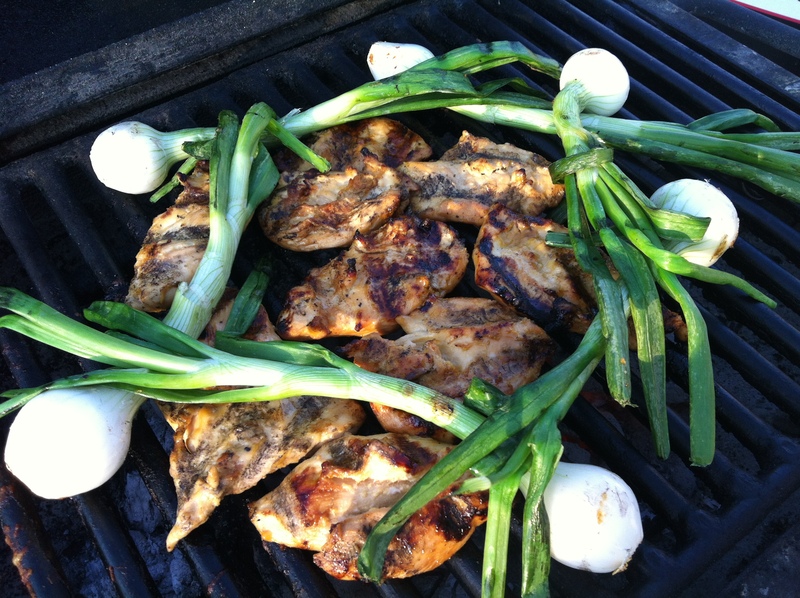 Throw your spring onions on the grill about halfway through the chicken’s cooking time. Once they’re on, keep an eye on them and turn them every few minutes, to evenly cook every bit. 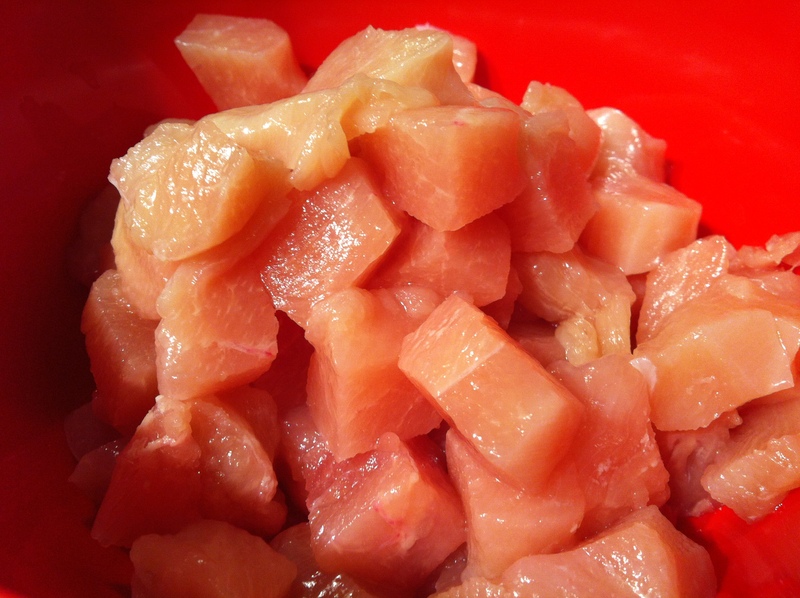 Sliced chicken, ready for tacos. I actually sliced mine even thinner than this. Right before your build your tacos, toss your tortillas right on the grill grate and let ’em warm up for a few seconds on each side. I prefer mine soft and malleable, which really doesn’t take long at all on a toasty grill. 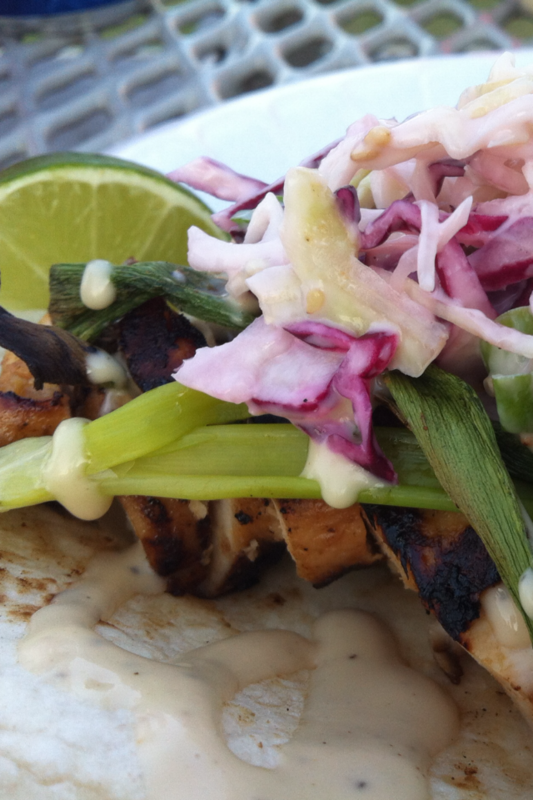 To assemble your taco: slice a piece of grilled chicken thinly, against the grain of the meat if possible. It’s going to be tender enough that it won’t really matter, but this makes for the perfect bite. Cut up as much as you like and throw it on your warm tortilla. Now dress liberally with the creamy dressing you made earlier. 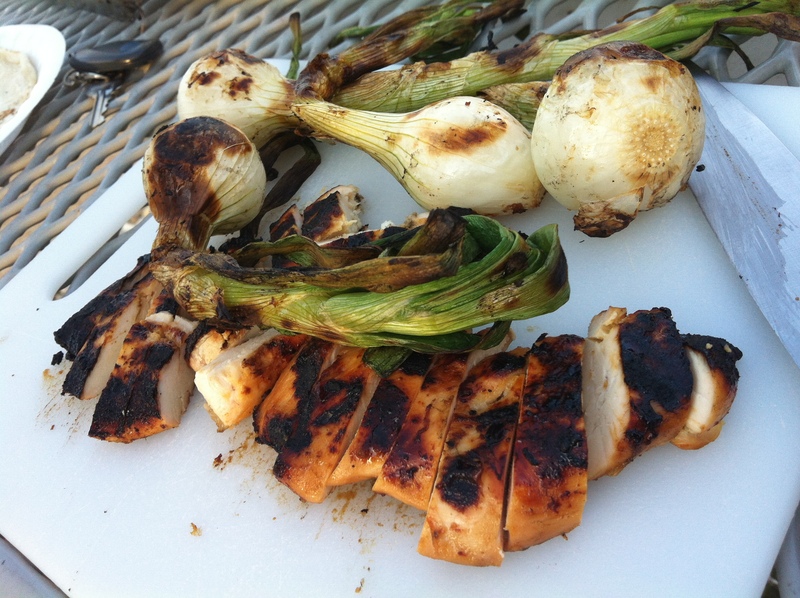 Slice a grilled spring onion or scallion up and toss that over the sauced chicken. Finally, pile some slaw up on top. Serve with a wedge of lime to squeeze over the taco, and voila. It’s the perfect combination of flavors — the warm, soft tortilla, which will start to soak up some of the dressing, the awesome crispy char of the sweet/salty/tangy chicken, and the crunch of the slaw and sweetness of the onion make this a winning combo. A lot of ingredients pop up more than once in this recipe, which I think makes for a really complete end product. 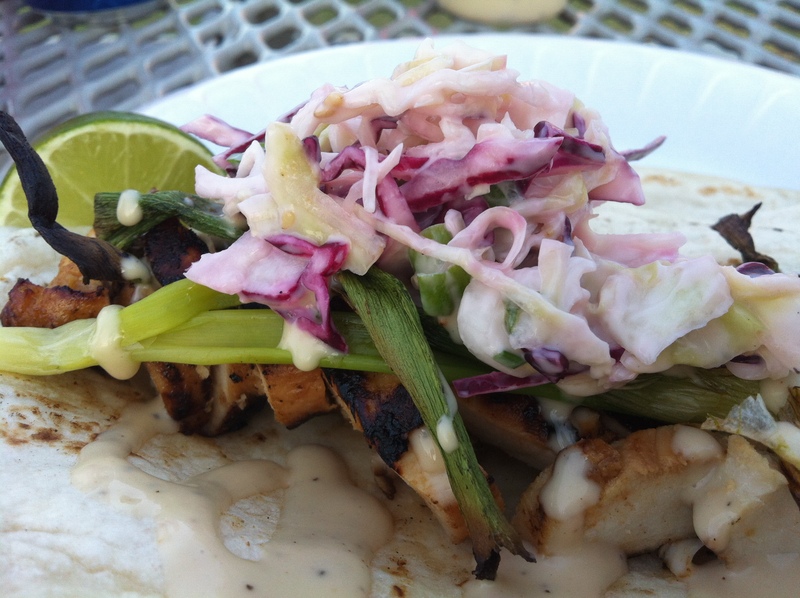 For example, there is scallion in the chicken marinade, the creamy dressing, the slaw, and on the taco. Each application is different, but not overpowering. 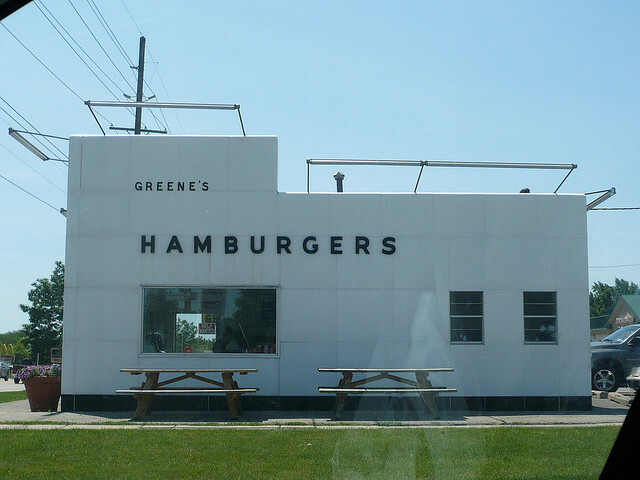 If you ever find yourself in a suburb of Detroit called Farmington Hills (it’s a bit of a long shot, I know), you simply must try Greene’s Hamburgers. This restaurant has been a family favorite since decades before I was born. My dad and his 5 siblings, lovingly raised by my Namma and Dampy, grew up in a small house (that’s eight people total in a house with just one bathroom!) 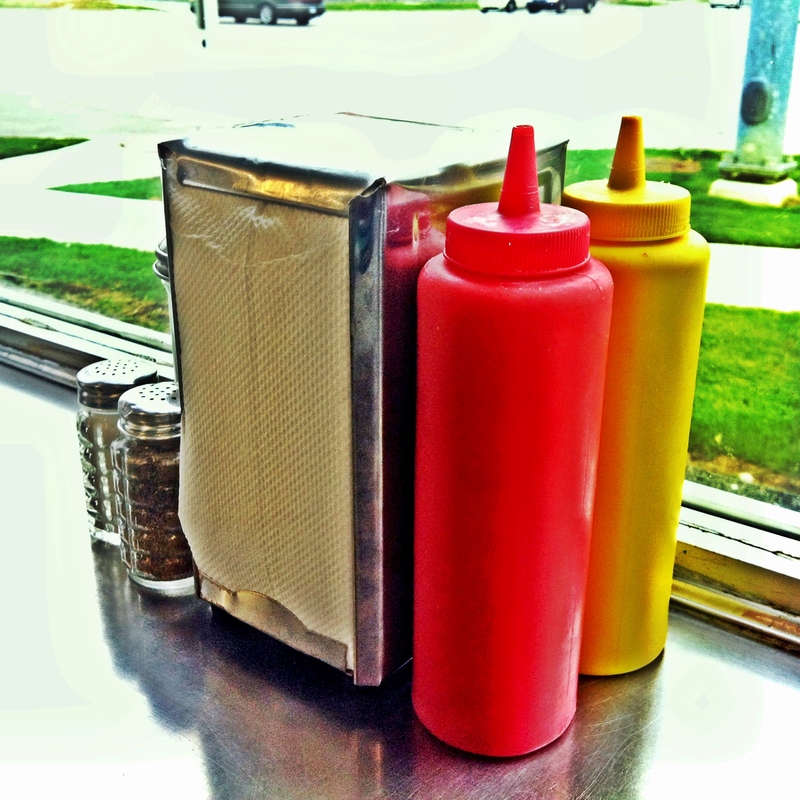 around the corner from this famous diner-style burger joint. My dad has memories of walking there as a kid and bringing home a bag of 6 burgers for a grand total of 96¢! Can’t beat it. The prices have changed a bit since the late ’50s, but as my family tells me, every other bit of it has remained exactly the same. 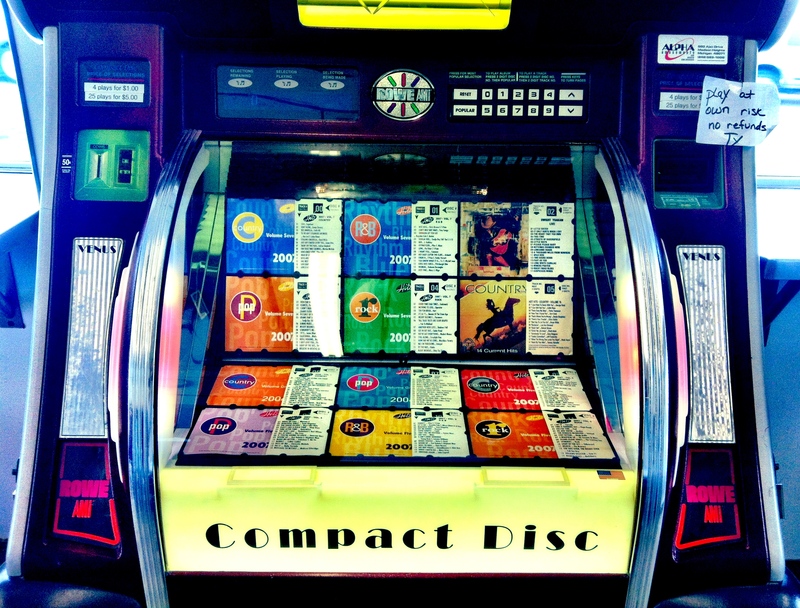 From its shiny white exterior to the beautiful, old ‘play-at-your-own-risk’ jukebox (my uncle selected some Janis Joplin and Beatles during our recent visit), it feels like you’ve gone back in time — even aside from the food, visiting the joint alone is an experience you won’t forget. Every summer during our annual family trip to Michigan, at least some of us stopped here for burgers to relive the age-old tradition of juicy, Midwest, never-frozen, griddle-cooked beef burgers. Somehow, at least in my memory, I had never been. I’d heard about it a million times, been shown pictures of the food (thank goodness for being raised in a family of foodies), and seen my Dampy sport his Greene’s T-shirt on several occasions, but in the midst of the craziness and fun-filled days at the lake with the people I love the most, I missed the boat — up until last week. My first Greene’s experience (with 6 other Thoresens) blew me away. I couldn’t get enough. No, really — I ate 3 cheeseburgers…2 singles and 1 double. With fries. And a chocolate malt. Ehhh. Don’t know where my enormous appetite came from that day, but I do know that it sure as hell came at the right time. 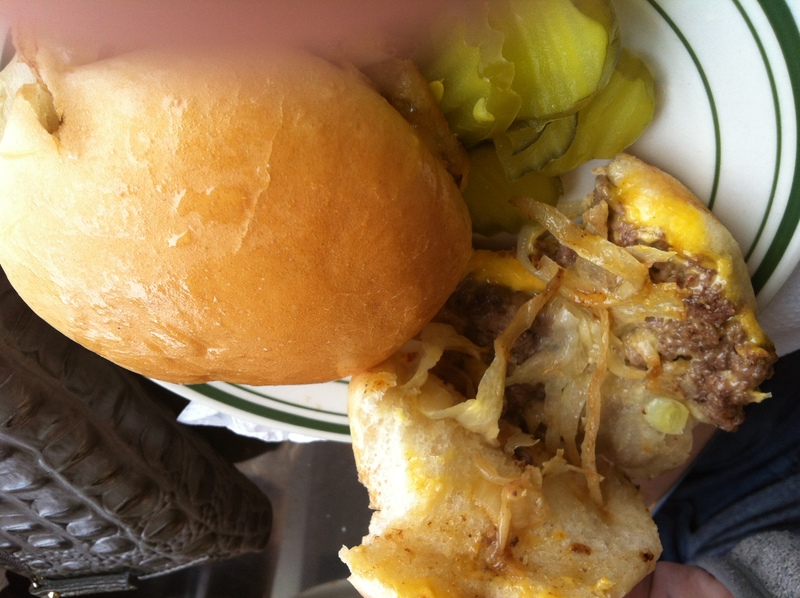 Small balls of ground beef are smashed flat into patties over slices of white onion on the hot, greasy griddle, and then topped with your choice of American cheese, sliced dill pickles, ketchup, and yellow mustard, all on a soft, smushy, white bun. 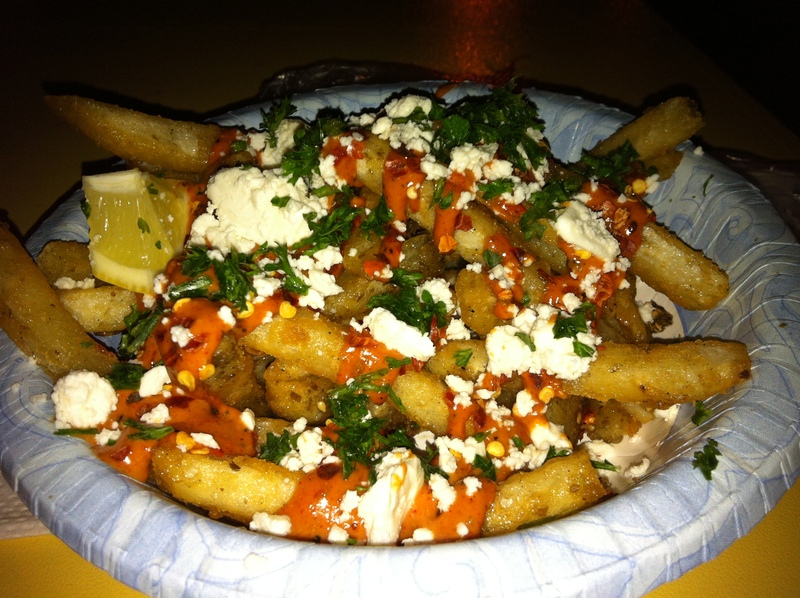 The fries are crinkle cut and served right out of the fryer, piping hot, just as they should be, allowing you to enjoy a salty, crispy exterior with a soft, steaming, fluffy inside. 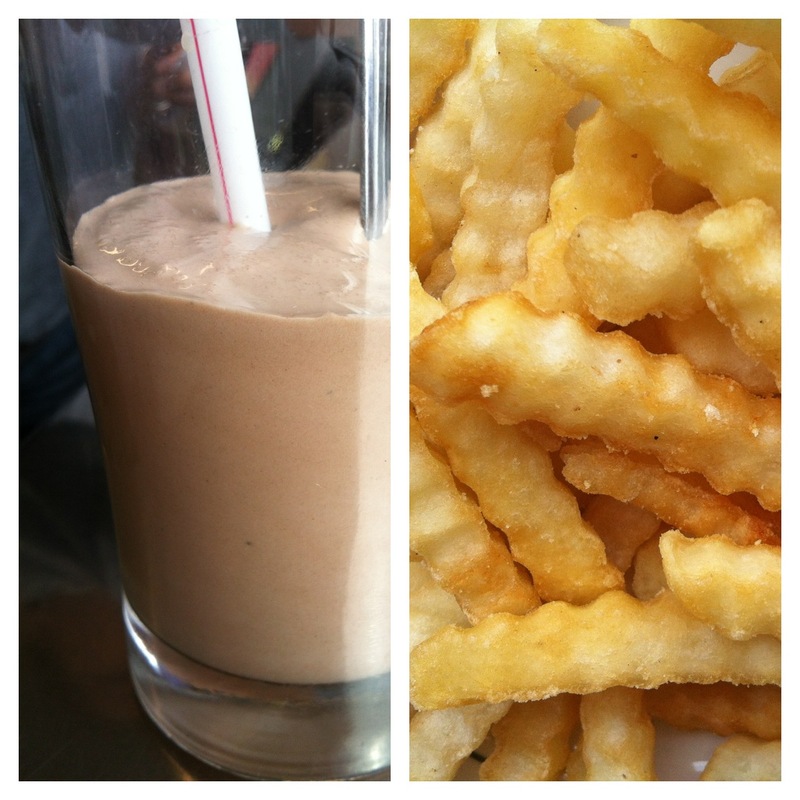 The malts are classic (I dipped fries in mine — I’m a big sweet/salty combo girl) — thick, rich, and not too sweet. The sodas come in one size only, just as they did in the ’50s. Natually, after my first Greene’s experience, I was transfixed. 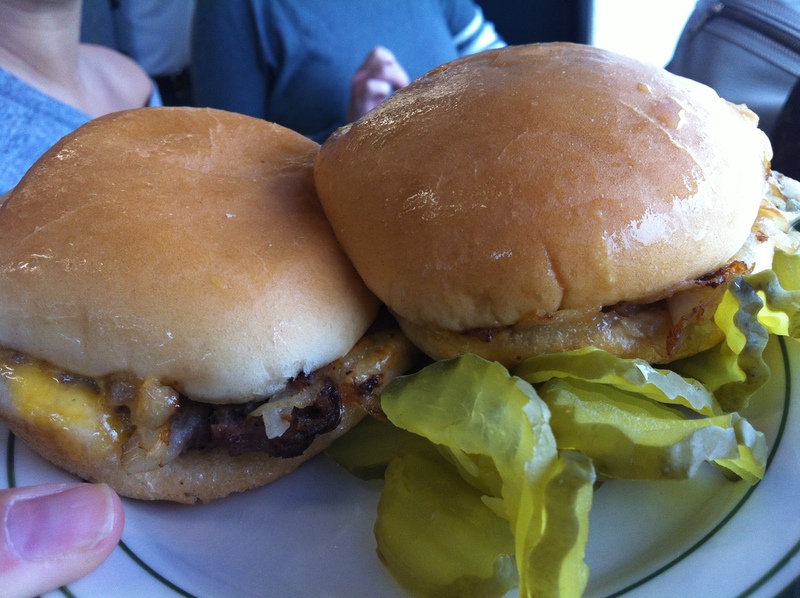 I wanted these burgers again and again, and most of all, I wanted to share them with Kyle. So I did my very best to recreate a Greene’s burger at home. My Auntie warned me that it was a ballsy move, and she’s absolutely right. They aren’t exact, and no other burger ever will be. But I gave it a shot, and I think I came pretty close. These burgers are simple, classic, and mouth-wateringly all-American. I hope you guys love them! I started with a pound of 85-15 ground beef. This isn’t the time for super-lean. 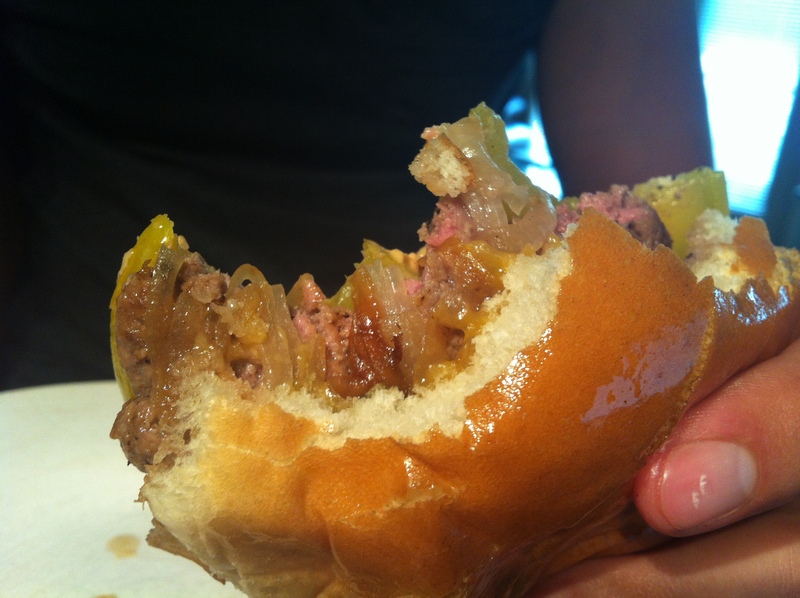 Greene’s burgers are juicy and a bit greasy, which is the point. Also, there’s no mayo on this burger, so you’re even further encouraged to take advantage of the grease factor, otherwise, you’ll end up with a dry patty. One other thing — I almost exclusively buy my groceries at the HEB here in Austin (major grocery chain), which is super cheap and awesome. There is a lot to admire about HEB. I remember, back in Boston, I searched 3 grocery stores one day, looking for canned chipotle chilis in adobo sauce, to no avail. HEB, on the other hand, practically has a whole aisle devoted to them. For these burgers, however, I bought some fresh ground, organic beef at Whole Foods with the super high animal welfare rating (whatever that means — doesn’t that sort of equate to a jail bragging about excellent accomodations and conditions for the prisoners, and then killing them?). I would never, ever turn my nose up at the standard grocery store stuff, but I wanted the absolute best beef I could get my hands on for these, since the whole point is to highlight that ingredient. Honestly, I think spending a few bucks more did make a difference. I separated my pound into 12 equal-sized pieces. 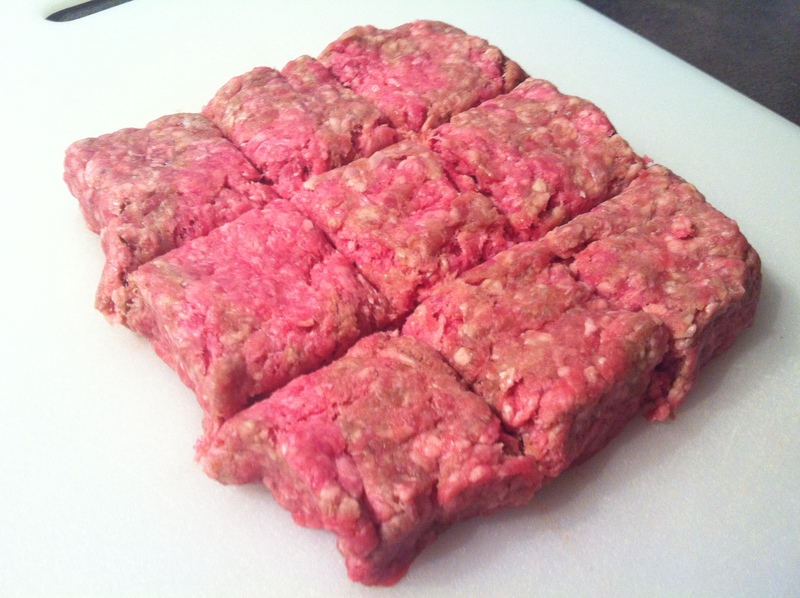 I did this by forming a thick rectangle shape with the meat and then cutting it into small pieces. You see 9 in the picture, but I decided 9 didn’t make small enough pieces, and recut 12 (and subsequently forgot to take a picture). They will be about the size of small meatballs. Each of these is a “single.” Everyone has a different opinion on their meat-to-bun ratio, and doing it this way, you’ll be able to tailor-make every burger however you like. I loved the single at Greene’s, but the double hit my meat-to-bread ratio spot on, so that’s what I made for Kyle and me. 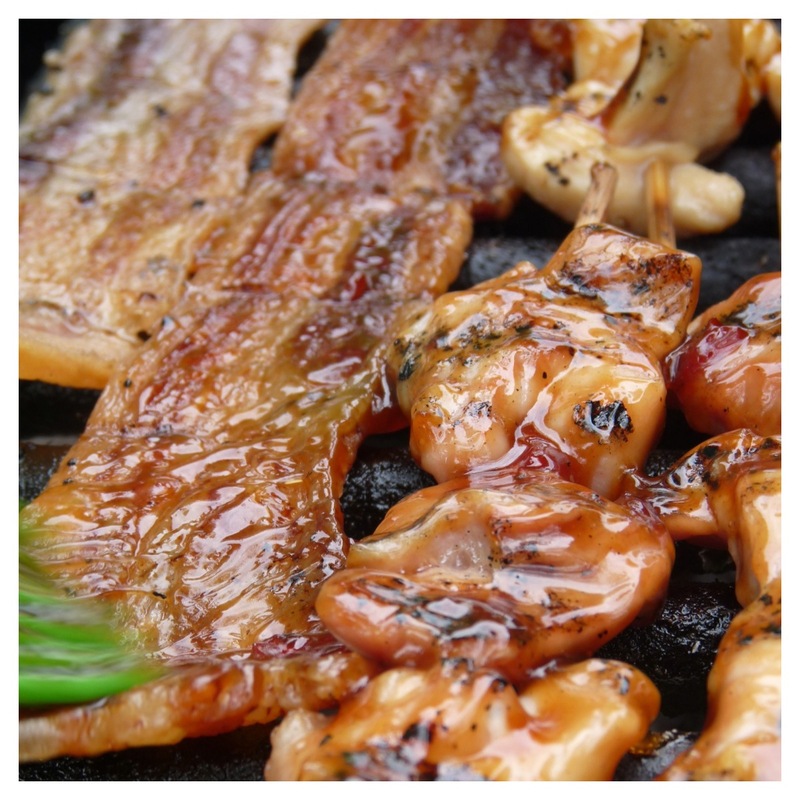 It’s best to prep your meat first so that it can come up to room temperature while you get your other fixings ready. 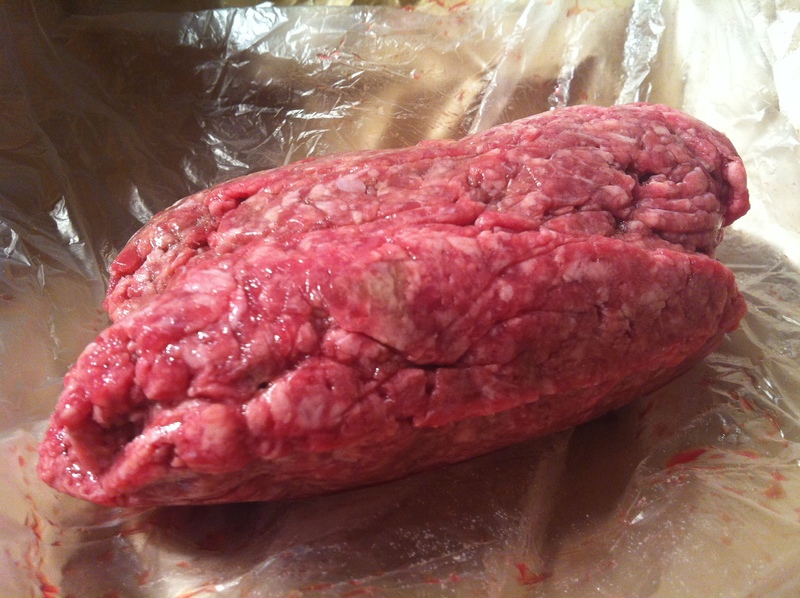 Roll each piece of meat into a ball and smash it just slightly, so it’s still about an inch thick. 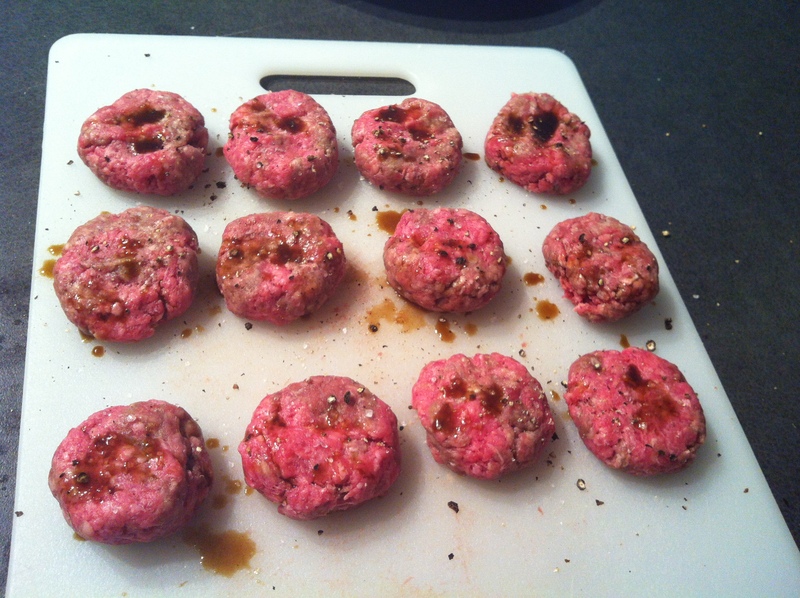 Sprinkle salt, pepper, and Worcestershire sauce over both sides of each ball of beef. Cover loosely with waxed paper and let these hang out on the counter top for the next few minutes. Next, you’ll want to make sure you have everything ready so that as soon as your burger comes off of the heat, you can slap it together and enjoy while it’s good and hot. 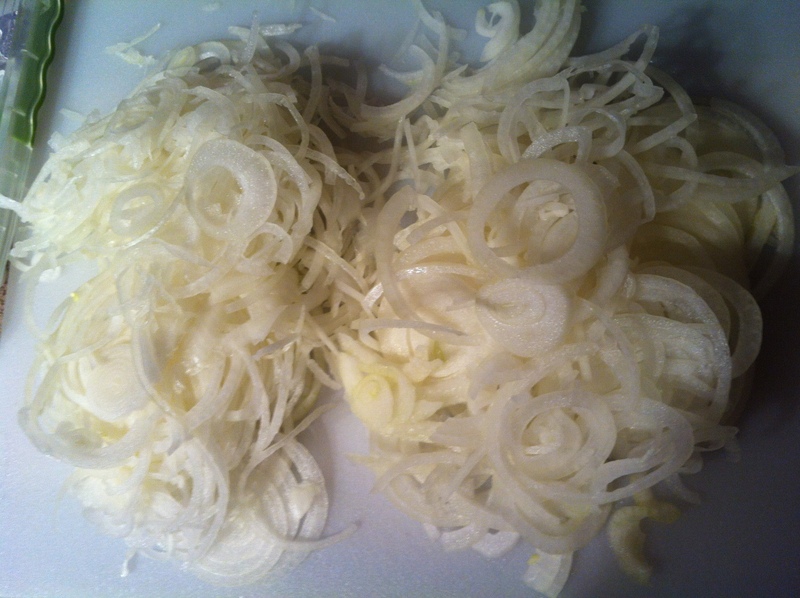 Slice a white onion on the thin side. I used my mandolin, but as (another) Auntie (who happens to be a professional chef) taught me recently, a mandolin is not a substitute for great knife skills. A great tip to keep in mind, especially for me, considering how heavily I rely on mine. 🙂 Slice up some pickles, and get your cheese unwrapped. I happen to adore American cheese. I know it’s not the healthiest, but on a burger, it’s 100% my preference. I can’t count the times my best friends and I have discussed and debated the best cheese on a cheeseburger. We know how to focus on the important things in life, that’s for sure, and I mean that with no sarcasm. Kyle doesn’t care for American cheese. Since I love him so much, I figured I could alter the original recipe slightly and top his burger with orange cheddar instead (his burger cheese preference). Just slice a few pieces nice and thin if you go this route. Get your ketchup and mustard ready (if you want them). As I mentioned, these are all optional toppings at Greene’s. My preference was just onions and cheese, then pickles on the side and I dipped every few bites of the burger in ketchup. As much as possible, you want to celebrate the beef, but everyone does that differently, so listen to your heart when it comes to toppings. Now that everything’s prepped, the magic begins. I don’t have a griddle at home, so I used a cast iron skillet — it worked perfectly. If you don’t have cast iron, use your darkest pan — it will get hot quickly and give good color to your onions and beef. You want it at about medium-high heat. Add a little bit of a neutral cooking oil (veggie, canola, peanut, whatever you’ve got) and let that heat up for a minute or two. 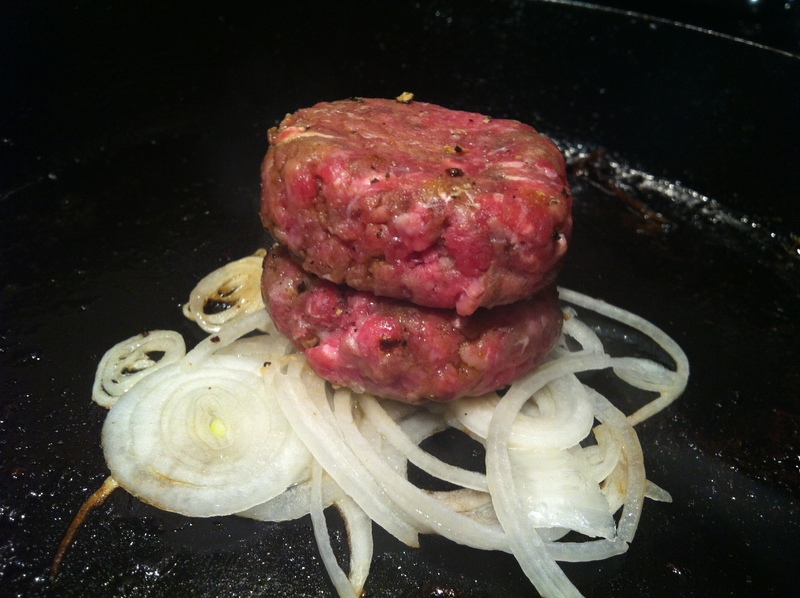 Now, throw a small handful of onions on to your hot pan, fitting them into a little pile the size of a burger patty. I underestimated the amount for the first burger, because I wasn’t sure how much they’d cook down in the time it takes for the beef to cook through. Just keep that in mind — they reduce in size pretty quickly. Give the onions a few seconds, then stack your beef on top. As I mentioned, I did all doubles (as you’ll see in the pictures). 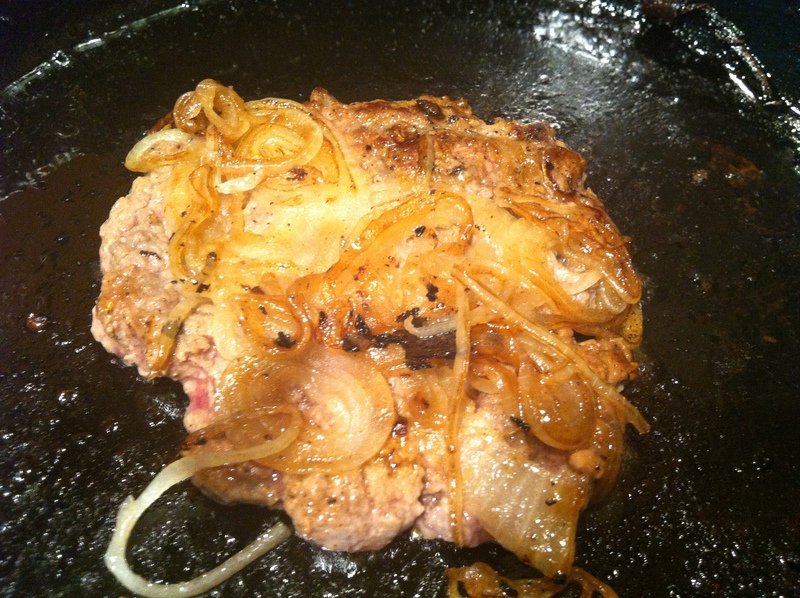 Next step, use a spatula to smash the beef down into a patty, right on top of the onions. I’ve heard more than once before that this is the wrong way to treat ground beef, and that it will inevitably squeeze out all of the juices. Not so in this case, tried and true, especially if you’re using beef with a higher fat content, as we are. As you mash your beef down, don’t worry too much about shape. 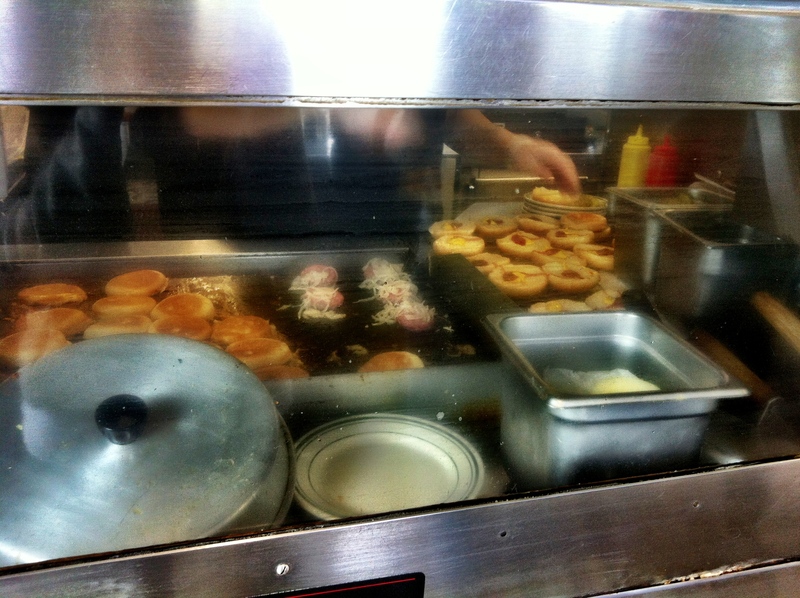 Greene’s burgers aren’t perfect circles, but they’re close enough. What’s important is that you’re sort of pressing your onions into the beef patty, and the fat from the beef is coating the onions and helping them to cook and simultaneously adding a TON of flavor. Flip it after about 3 minutes and immediately top with cheese, and then cover with the top half of the bun. This helps to trap in some steam, which melts the cheese and warms the bun in the perfect amount of time it takes for the burger bottom to brown up. Here’s one great tip that my Dad told me about these burgers. He always noticed that the top of the bun at Greene’s is a little shiny from the splattering grease on the griddle that hits it. I loved that little quirk. 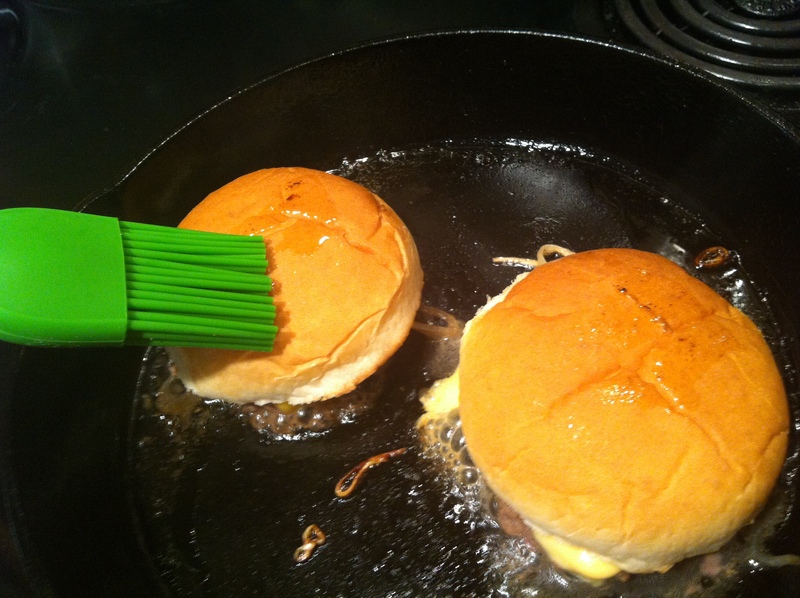 I didn’t have enough burgers going at once to provide adequate grease splatter, but I did just buy a culinary brush! Perfect. I dipped the ends quickly into the oils in the pan and lightly brushed the tops of the buns. I swear, it made a difference. So awesome. 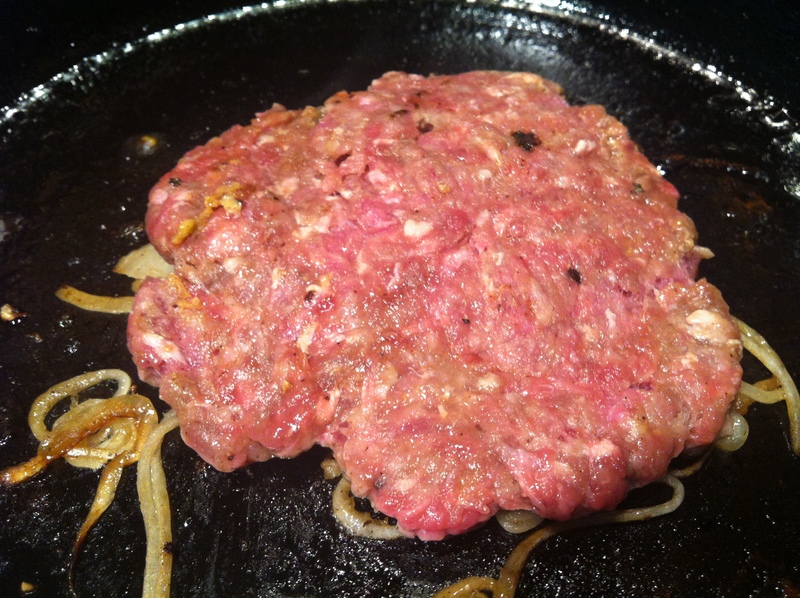 After another 3 minutes or so, scrape it off the pan with a spatula, and place it on the bottom half of your bun. 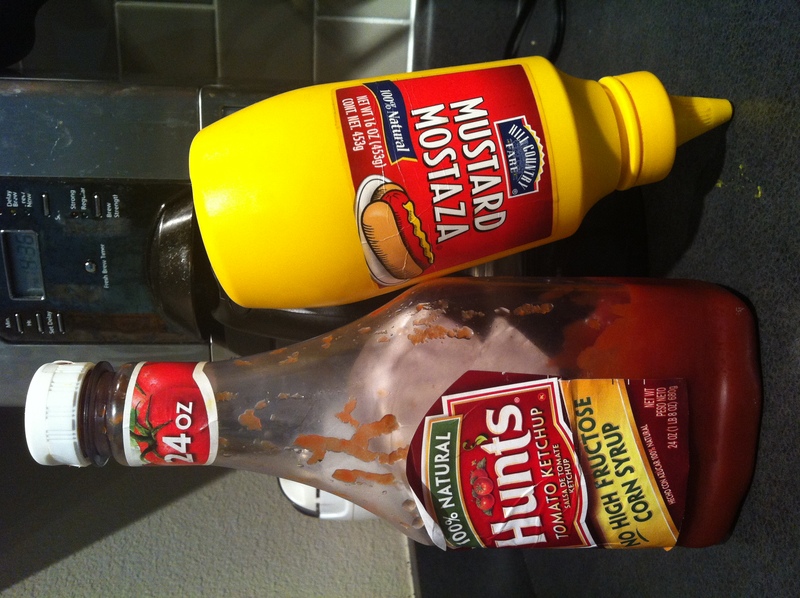 If you opt for mustard, ketchup, or pickles, go ahead and throw them on the bottom bun before you put the burger on. It’s important that the buns are simple and white. 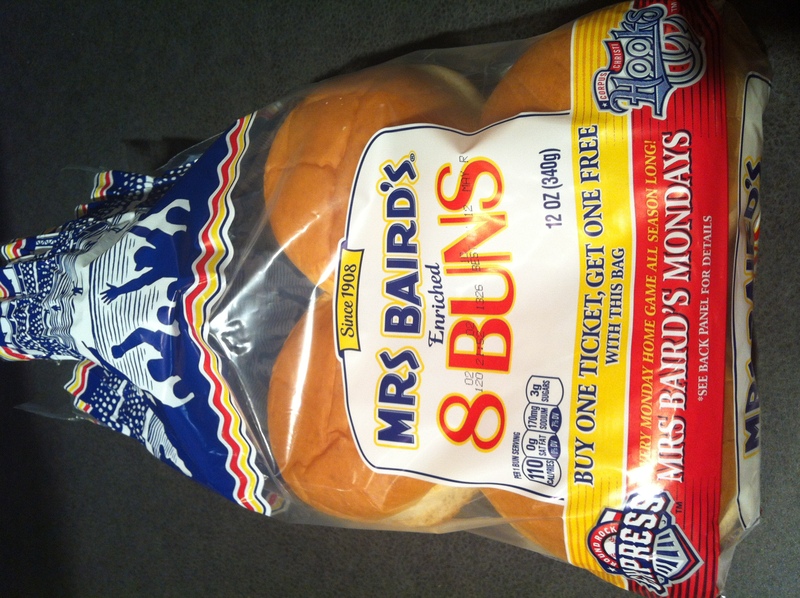 Probably the best way to choose is to go with the cheapest possible bun you can find at your grocery store. I can tell you Whole Foods will NOT have the proper bun for this type of burger, I’ve looked. I got mine at the 7-11 across the street and they were exactly right. I have a million stories, a million memories, a million small joys all contained in the word ‘Grap’. They are as much a part of me as the Norwegianness that flowed through his blood and into mine. I am Grap. You are Grap. Energy does not disappear. It changes direction, changes forms, changes appearance. It manifests itself differently in different times and different spaces but it is eternal. Grap is energy. Pure, razor sharp, goodness. Decency and virtue, in the shape of a tall, tough, Catholic boy from Detroit. Grap is eternal in every conceivable sense of the word. Eternal energy existing in our minds, in our bodies, on earth as it is in heaven. Big G came out of the sea to get thee. He got me. He got you. End of story. Beginning of story. 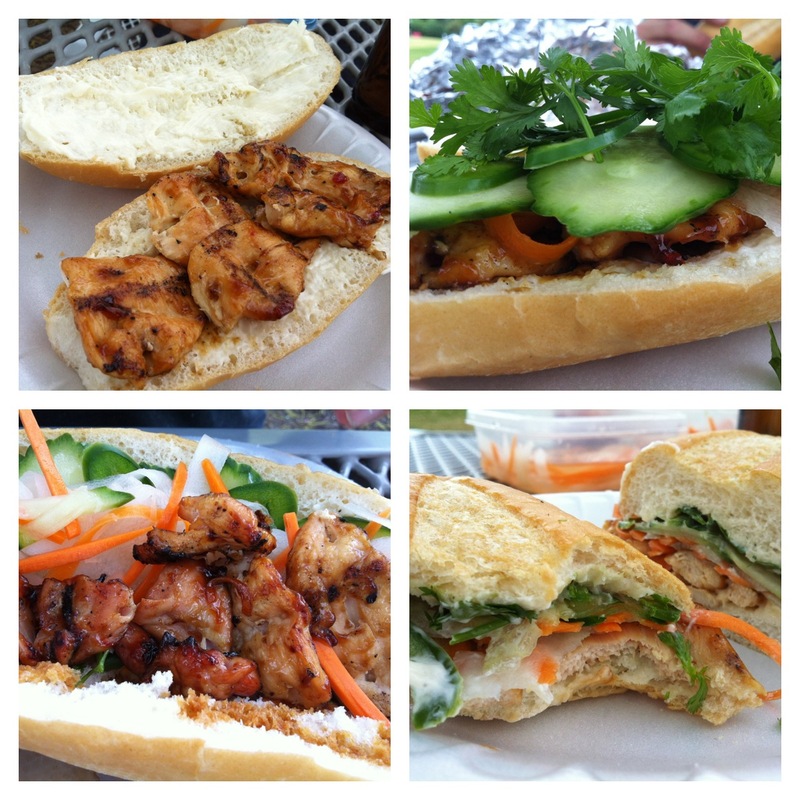 Kyle and I have been on a quest for awesome banh mi sandwiches since we moved to Austin. We assumed this would be an easy feat, considering Austin has truly wowed us in many different food categories, namely the obvious: barbecue, Tex-Mex, authentic Mexican, burgers. Which happen to be some of our very favorites. One oddity — pizza doesn’t appear to be as huge down here as it is in the Northeast. We’ve found some great places (Home Slice, East Side Pies, Firefly food truck), but they just don’t pop up as frequently. Makes me want to give Boston and New York a big kiss for the many brick ovens they’ve blessed us with. 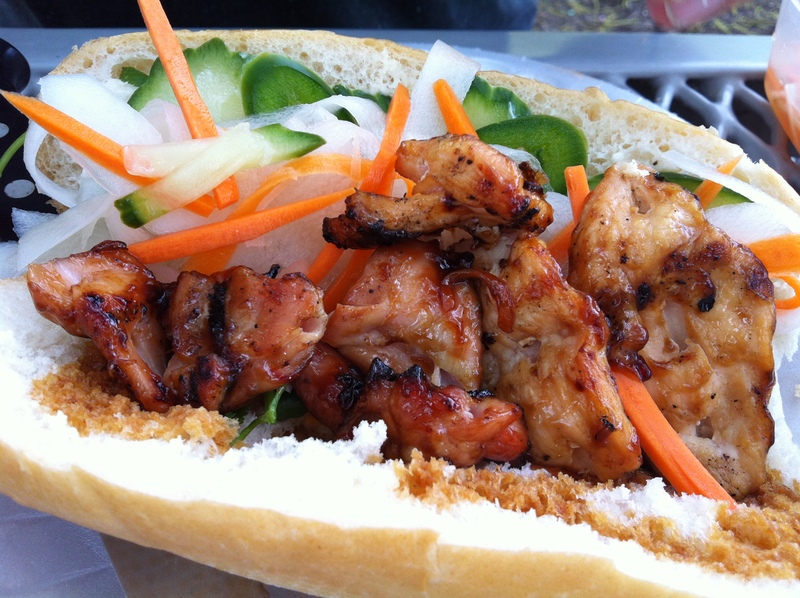 To get back on track, finding the ideal Vietnamese sandwich here hadn’t happened yet as of last weekend. Kyle tried one from Bite Mi (by UT campus) and we both tried them at Pho Oanh (one of 3 highly regarded Vienamese restaurants within a few blocks of each other on East Oltorf). Both were good, but not mind-blowing. To be fair, we were spoiled by Allston’s Super 88 banh mis back in Boston, which remain the best either of us has ever had. 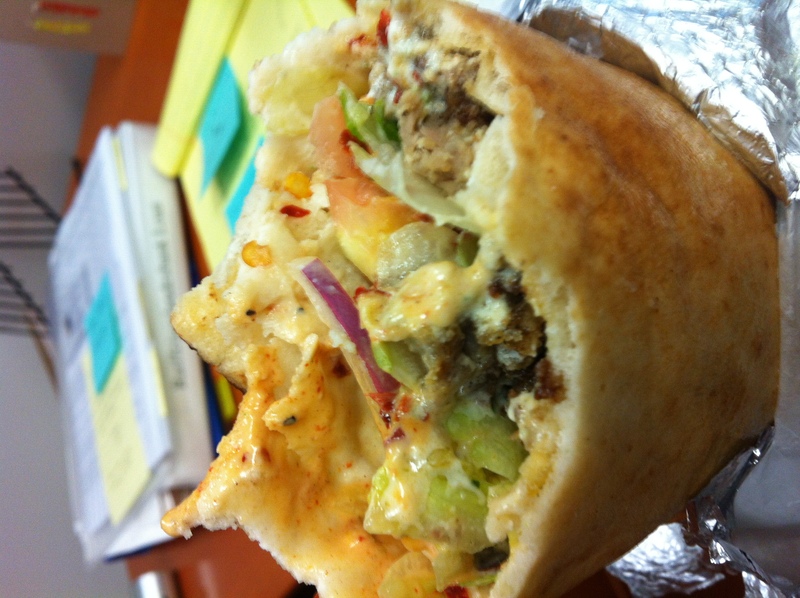 Perfect chewy bread, char-grilled meat, and some amazing sauce…I’d never know where to begin to replicate it. A creamy Asian-inspired honey mustard is the best way I could describe it. Also super cheap – $3.50 each and plenty filling. A craving for these can’t be satisfied by anything else. 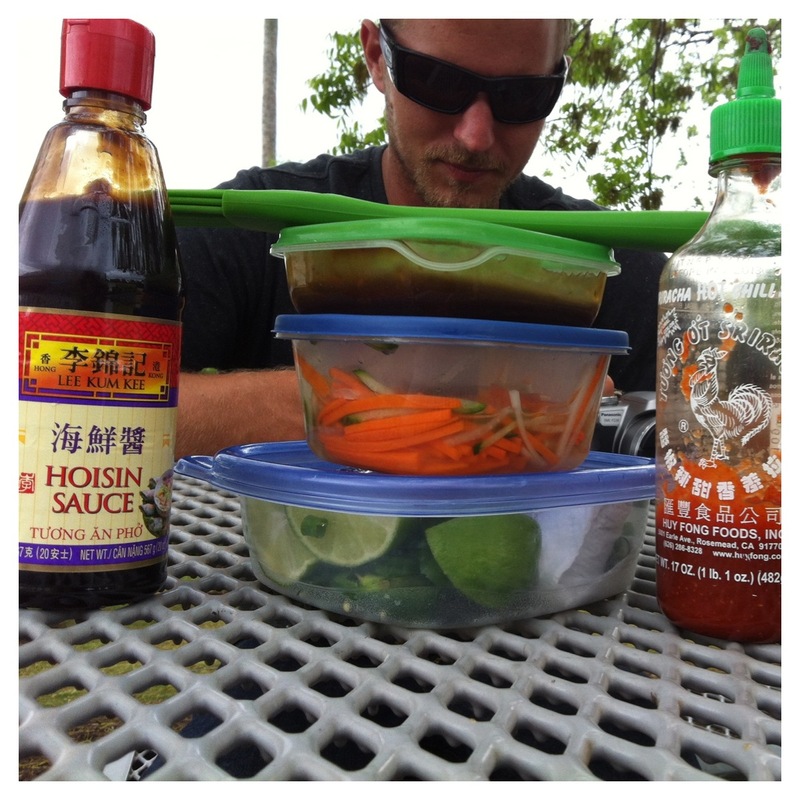 So, we took matters into our own hands late Saturday morning and had a homemade banh mi brunch out on the lake. It’s not a super quick meal to prepare, but every single step is enjoyable and SUPER easy and straightforward. The reward far outweighs the prep time. I can’t think of anything I’d rather do on a warm, lazy weekend than cook (and eat and drink) outdoors. The proper roll. My Dad taught me that this is almost the most important component for this kind of sandwich, and I couldn’t agree more. 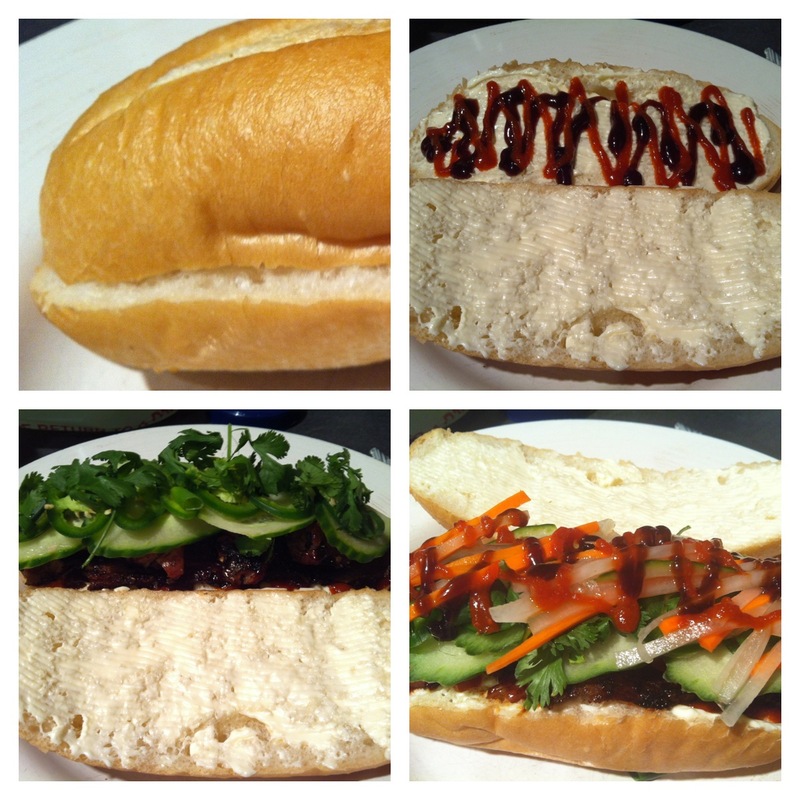 What you want is a french-style roll that is chewy/slightly crackly/flaky on the outside and soft/tender on the inside. And as fresh as you can get. For you lucky Austinites, the white sandwich rolls that HEB sells individually out of the big plastic bins for 25 cents a piece are absolutely, 100% spot on. I remember the first time Kyle and I bought them for deli meat sandwiches, we noticed that they seemed practically made for Vietnamese sandwiches. The meat! I wanted to experiment a bit, so I tried white meat chicken, dark meat chicken (thighs), and pork belly (which is essentially bacon before it’s smoked and cured). Lots and lots of different kinds of meats are traditional on this sandwich — it’d be harder to find one that wouldn’t be good. Chicken breast is sort of the safest route, in that it would probably appeal to the most people (plus, it’s easy…I’m sure a lot of you have some in the freezer right now). The dark meat chicken was my preference, though. Because it has a higher fat content, it holds up better to high heat cooking and doesn’t dry out. Really though, both were awesome. The pork belly came out good too, but it’s very rich and I liked it best mixed with the chicken on the sandwich, not standing alone as the only meat. The pickled veggies – usually carrot and daikon (a type of Asian radish). Kyle opted to pickle the cucumber too. The fresh veggies and herbs – cucumber, jalapeño, scallions, cilantro. The sauces. Mayo is absolutely essential here. If it really grosses you out, smear just a little on until the bread soaks it up and you can’t see it anymore. Or have someone else do that step for you :). I even bought full fat mayo just for this because I really do notice a difference (normally we try to stick to the olive oil mayo that has half the fat and calories of the heavier type). Additionally, Sri Racha is fantastic (as it is on almost everything) and my other favorite is Hoisin sauce (Asian BBQ-style sauce, this is usually what they serve with moo shu at Chinese restaurants). Any sweet Asian sauce would be good I think. Sweet chili sauce, teriyaki, duck sauce, plum sauce, whatever you like! There’s just something about the right combination of the above ingredients. It’s almost difficult for me to type this right now because I want another one SO badly. Here’s how I did mine, and even if one of you awesome readers tries this out at home, I will feel like I changed the world. First, get yourself a beer. 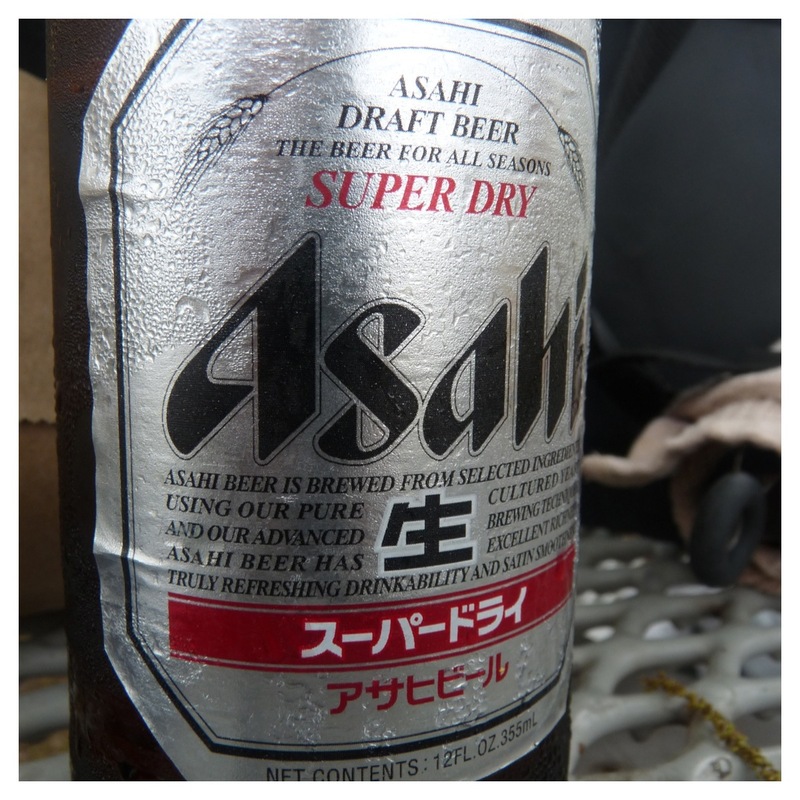 I bought a 6-pack of Asahis just for this occasion and drinking Asian beer while preparing these sandwiches made it even more fun. Now, even though barbecued meat and pickled veggies are involved, never fear — you don’t have to have anything prepped in advance of the day you make these. You’ll start by quick-pickling your carrots and daikon. 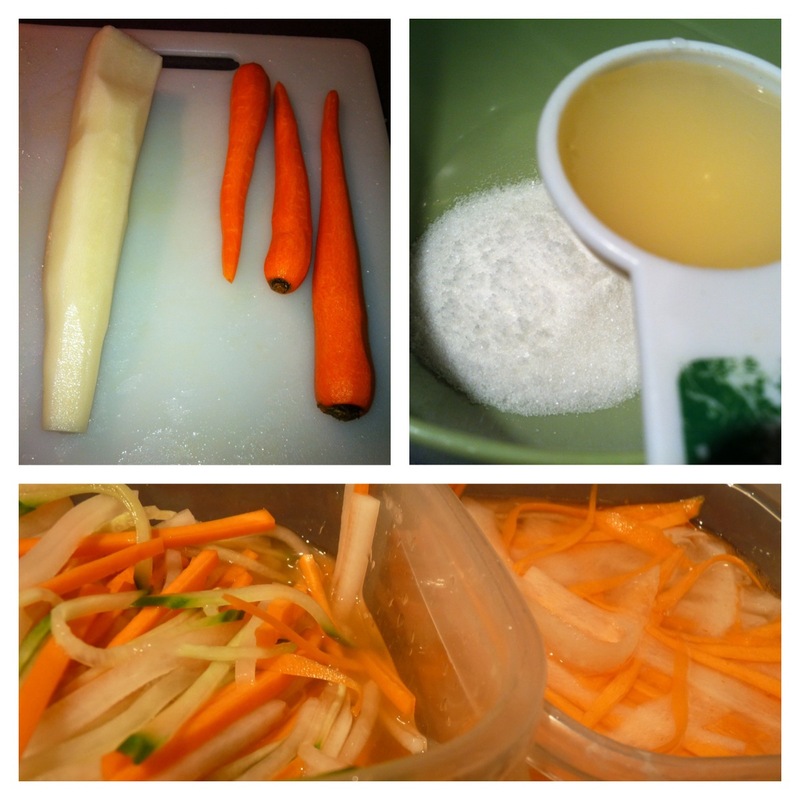 I used one large daikon root (the size of a huge carrot) and three small- to medium-sized carrots. This was more than enough for 4 sandwiches. Peel all and then chop into your desired shape. I think they’re usually julienned (like little matchsticks) but Kyle had a great idea to just continue using the peeler on the veggies to get thin, wide strips. 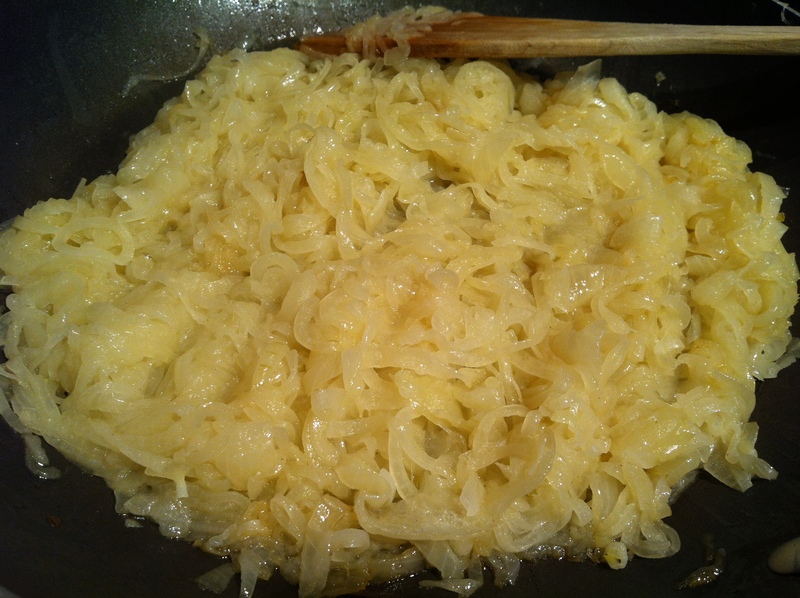 I tried both, and I liked the “peeled” style better — it absorbed the pickling liquid quicker. Plus, it was less labor intensive this way. 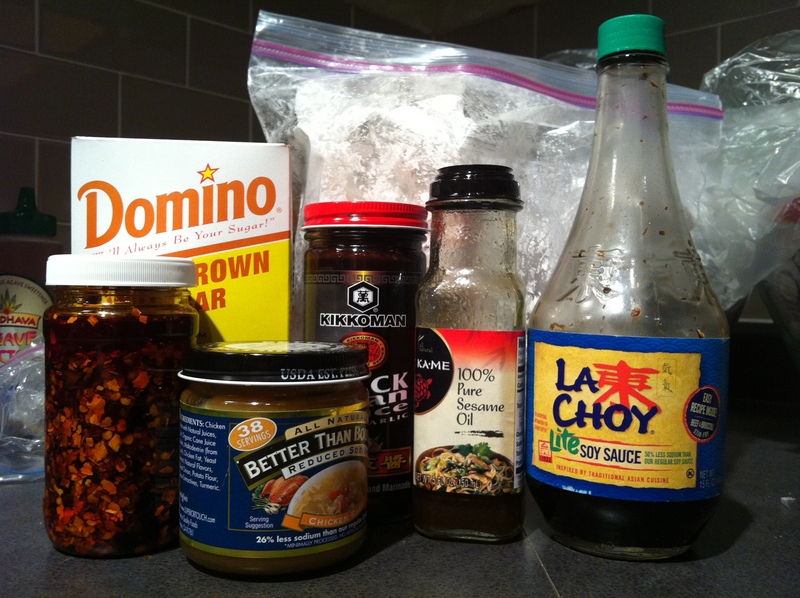 Mix together 1/4 cup rice wine vinegar, 1/4 cup white sugar, and 1/2 teaspoon of salt. Whisk until the sugar has pretty much dissolved. Now throw your veggies into this mixture. I’m sure you could use any vinegar but this is my favorite for Asian dishes. The veggies will be pickled enough in 30 minutes (just leave them outside the fridge for maximum pickling liquid absorption if you’re giving them only half an hour) and can stay in this mixture for days. I put mine in Tupperware so I could flip it upside down or shake it every once in a while to make sure the pickling mixture hits all of the pieces. Next, you’ll want to prep your meat. For the white meat chicken: I took one large chicken breast, trimmed it (I’m picky about chicken in that I don’t like “googlies.” One of the billion advantages of cooking at home — you know every single thing that’s going into your food!). Then, I sliced the breast into half-inch medallion-like pieces. I rubbed each piece with some veggie oil, placed it on a sheet of saran wrap, covered with another sheet of saran wrap, and pounded each piece to half its original thickness. This is definitely not necessary, but I love thin pieces of chicken best (mostly because they have more surface area which means more places for sauce to stick). Makes them extra tender too. Totally fine to skip the pounding though. 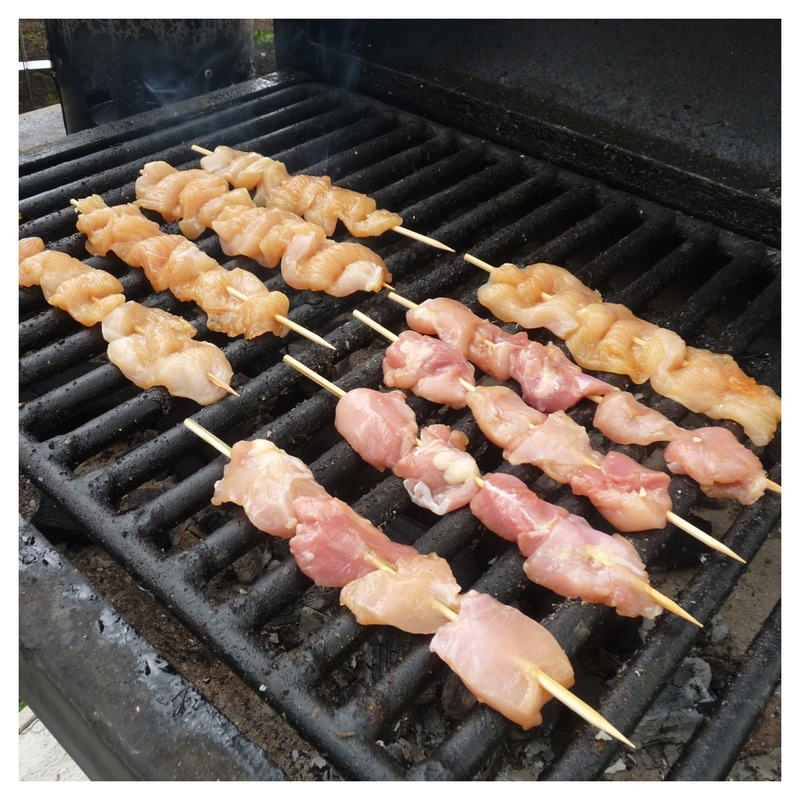 I threaded the chicken pieces onto wooden skewers that I had soaked in water for a bit so they don’t catch fire on the grill. 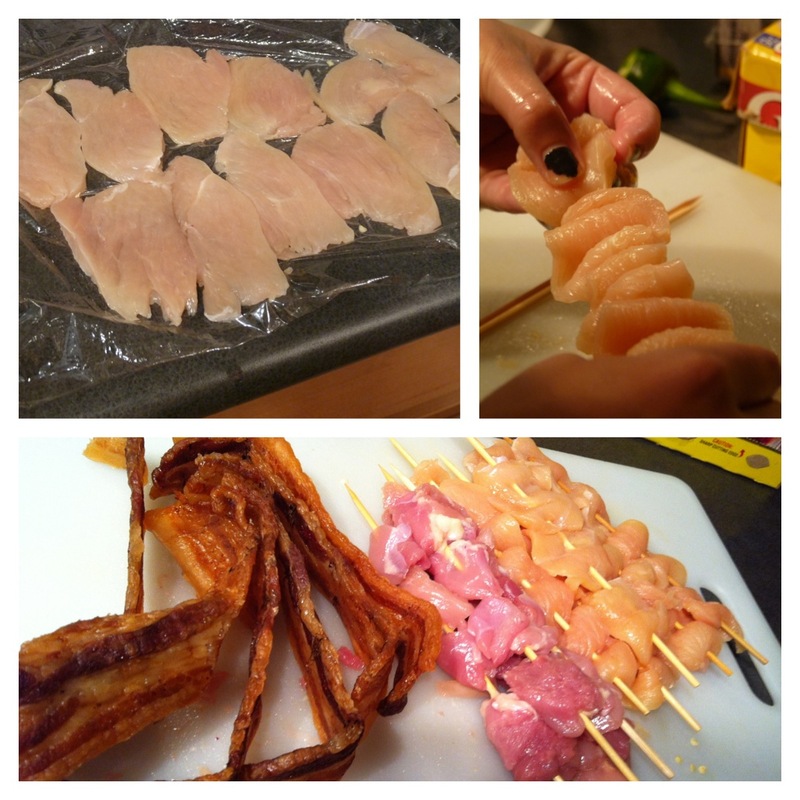 For the dark meat chicken, I cut the thigh meat into bite-sized pieces and pushed them onto skewers as well. And for the pork belly, I had the butcher cut thick pieces for me. I turned the oven on to about 250°, put the pieces directly on the rack, put a pan underneath to catch drippings, and then went to the grocery store for an hour. Most people would probably tell me that’s a great way to start a grease fire and burn our place to the ground, and they’d be right. Luckily it worked out just fine. I wanted to render a lot of the fat out of these pieces and make them crispy, but not cook them all the way (the grilling later will finish them up). Your meat is almost prepped. 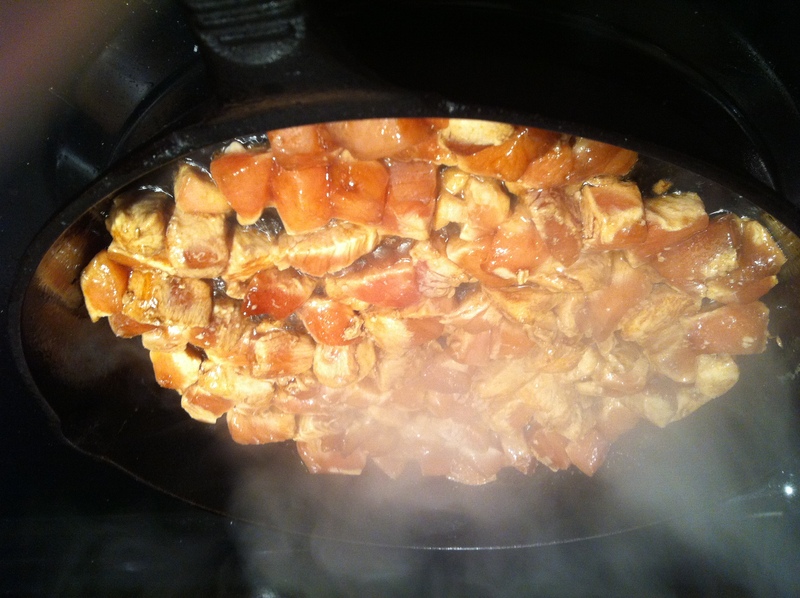 For the final step before cooking, sprinkle all meat with soy sauce, on both sides. This is the only meat seasoning you need up until this point. For the remaining veggies, just slice ’em the way you like for sandwiches. I used my trusty mandolin and did the cukes on the bias and very thin. Also, make sure to buy English cucumber for these, the kind that comes with the cellophane covering it. You can eat the skins on this variety, and they’re seedless, which makes for a better overall sandwich experience. 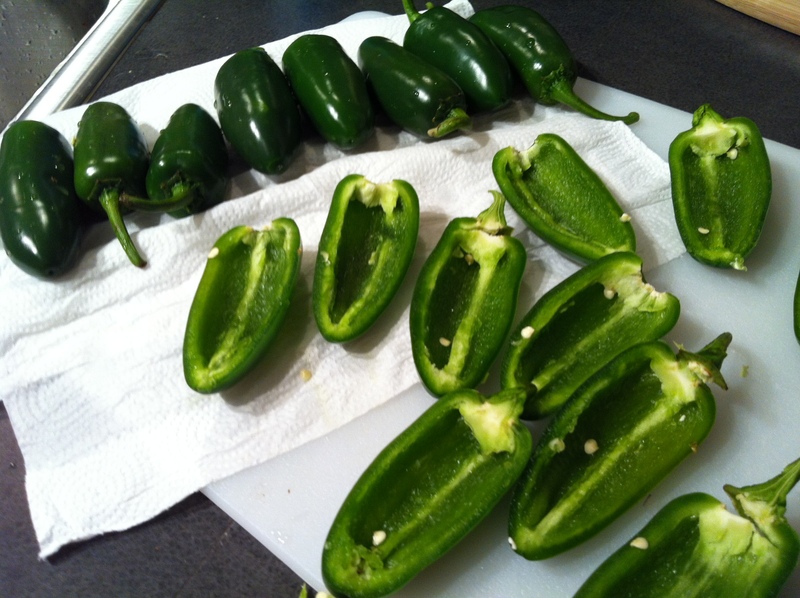 I did the same for the jalapeños. For the cilantro, I just rinsed it well and left the leaves whole. The scallions can be chopped. Last thing you’ll need to do in advance is make a sauce to brush onto the meat as it’s grilling. 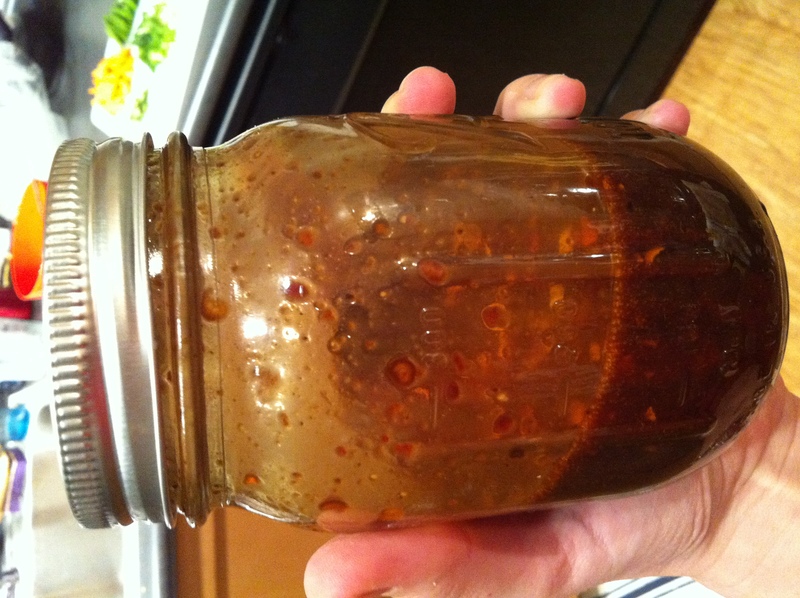 I did 1 part sweet chili sauce and 1 part hoisin. Again, I think any Asian-inspired sauce with some sugar in it is going to work marvelously (or mix honey with some soy sauce and lime or orange juice). The point is just to get a little carmelization on the meat once it’s cooking. Now, pack everything up (including sauces) and head outside! If you’re grilling. If it’s raining, or if you don’t have a grill, or you don’t want to grill, stay inside and sauté your meat on the stove top. Either way, open another beer. We got our coals hot, but not as hot as you’d want for burgers or steak. I guess the best way to achieve this is to use less charcoal and spread it evenly on the bottom of the grill after it’s hot. We just bought one of those grill towers that speeds up the burning of the coals and it’s proven to be a good investment so far. For a gas grill, just set it to low. Throw the meat on and cook for a few minutes on each side. After you’ve flipped it, brush sauce on it, give it another minute, turn again, and sauce the other side. 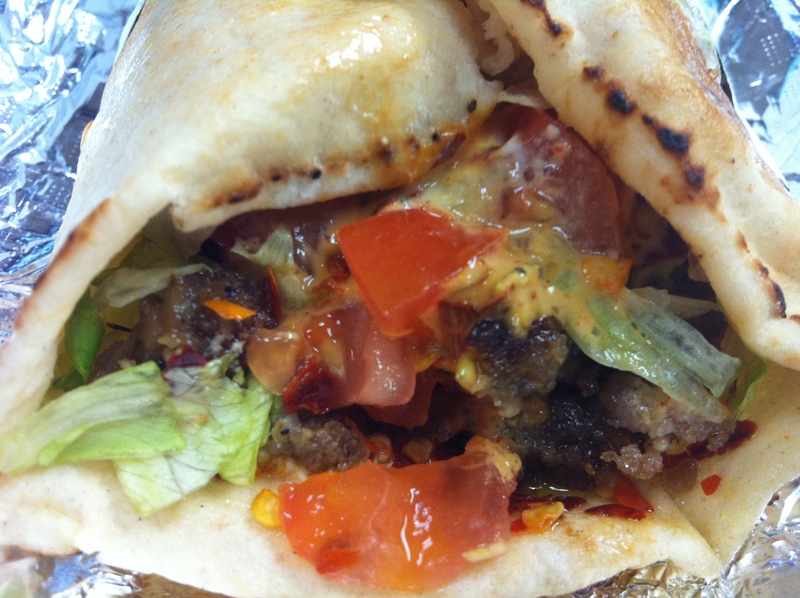 The reason we didn’t sauce the meat before it went on is because the sugar could burn too quickly. Adding it towards the end was perfect. Once your meat is cooked, pull it off, let it sit a few minutes (if you can!) and begin sandwich assembly. I cut my roll in half, mayoed both sides very liberally, then built, from the bottom up: meat, pickled carrot and daikon, cukes, cilantro, jalapeños, scallions, then drizzled Sri Racha and hoisin over the top. Smush it down, cut it in half, and voila, the next few minutes you’ll spend eating this sandwich will feel like you’ve died and gone to heaven. The crispy outside of the roll gives way to the glazed meat and squishy inner bread saturated with the rich sauces, complemented perfectly by tangy, salty pickled veggies and crunchy fresh ones. The cilantro adds awesome freshness and pulls everything together. All-in-all, it’s just the most perfect combo of ingredients. Hope you enjoy this perfect summer sandwich and I’d love to hear about any additions anyone can think of. I think basil would taste good on here too (I love it in my Thai food) and could definitely take a little more heat by replacing the jalapenos with serranos. 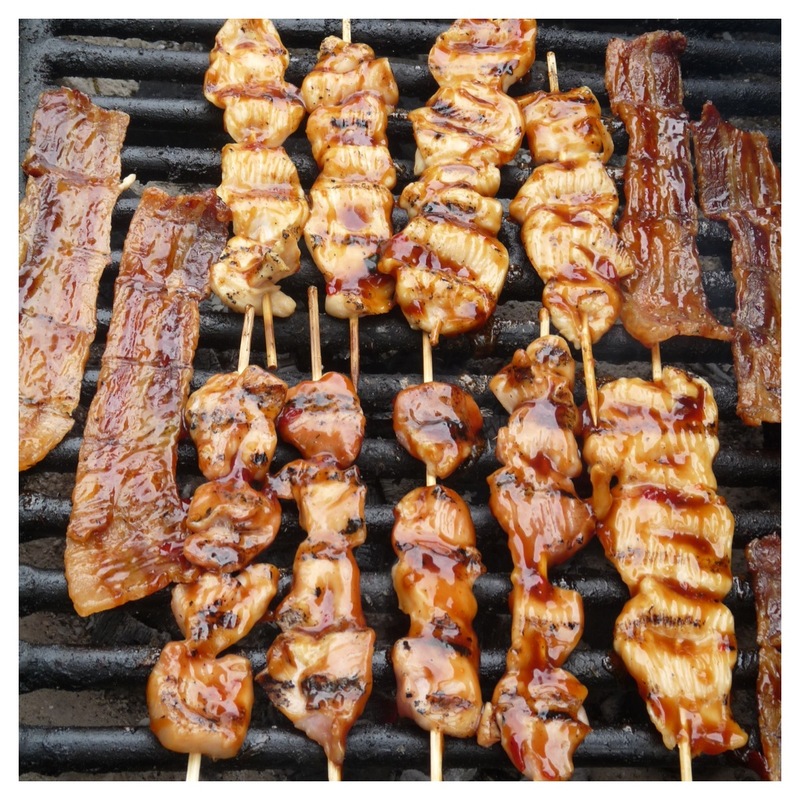 Also, if you’re not a carnivore, grilled tofu or portobello mushrooms could be a great sub for the meat, you could even prepare them the exact same way with the soy and sweet sauce. 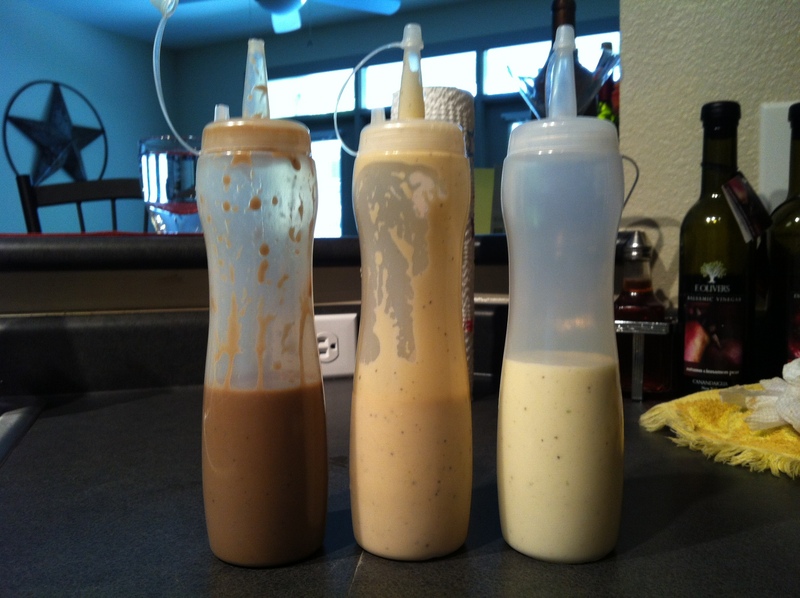 I thought about mixing the mayo with a little hoisin and Sri Racha too to create my own “secret sauce.” Yum. Kyle squeezed lime juice on his sandwich too, I will try that next time for sure. *Also, thanks to Kyle for the awesome pictures. I can take credit for the crappier ones, but the nice ones (meat being glazed, etc.) were all him! Summer is right around the corner! In Austin, we’re lucky enough that it’s already here — at least, the weather is. Real summer in Texas (I’m told) is reserved for multiple 110+ degree days on end where you can only survive if you’re completely submerged in a freezing cold spring or sitting in your refrigerator. Summer means less clothes and bikinis, which are both a lot more fun if you’re feeling healthy and fit. While I can’t commit to a super-strict regimen that cuts out all things delicious, I certainly can afford to make some changes and lighten up on the heavier things I love so dearly. Among several other fad/lifestyle change diets, I’ve heard a lot lately about eating “clean.” Which is basically limiting your intake to veggies, lean proteins, complex carbs, and healthy fats. 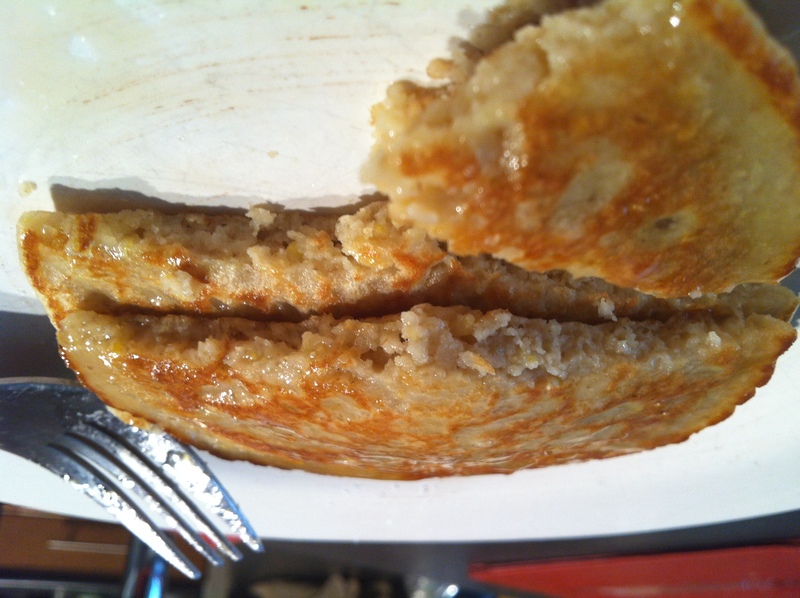 One recipe that seems to be getting a lot of buzz are “clean” pancakes. 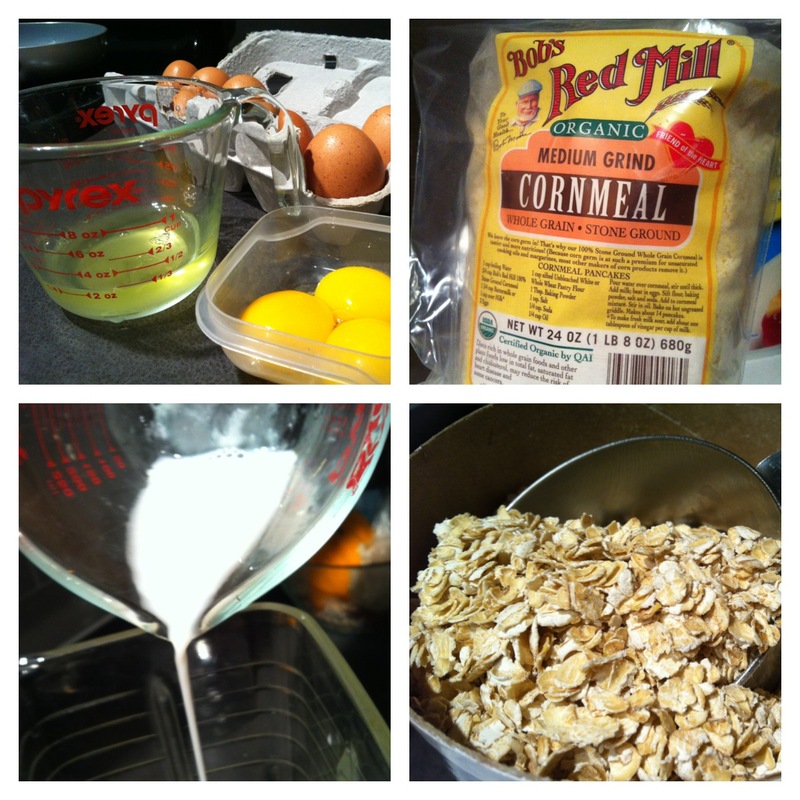 Consisting of oatmeal, egg whites, flax seed oil, wheat germ, and a few other things, they sounded…interesting. I wanted to give them a shot, but I don’t have flax seed oil or wheat germ in the house. Also, I’m not the kind of person who can replace delicious, fluffy, white pancakes with something that tastes like cardboard and be okay with that. Other “clean” versions I saw looked great, but were flavored: banana walnut, apple cinnamon, or pumpkin. 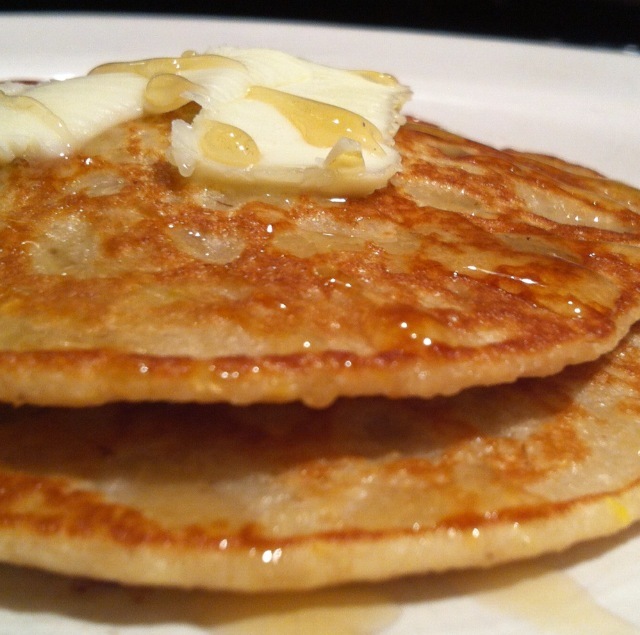 All sound awesome, but I was craving good, old fashioned, butter-and-syrup-soaked pancakes. So I thought I’d make up my own version. After a bit of trial and error, I came up with something that I consider a very happy medium (while still leaning heavily towards the healthy side of the spectrum). They’ve got great texture, tons of protein and fiber, and are very low in calories (especially compared to their delicious white flour/white sugar predecessor). And much to my surprise, they don’t taste like cardboard! The recipe below will yield 6 small pancakes. First, you’ll need a blender or food processor. I used a blender and it was perfect. Plus, it’s a one-bowl recipe this way — you can even pour them from the blender directly into the skillet. Now buzz all of it together for a good 30 seconds or so. 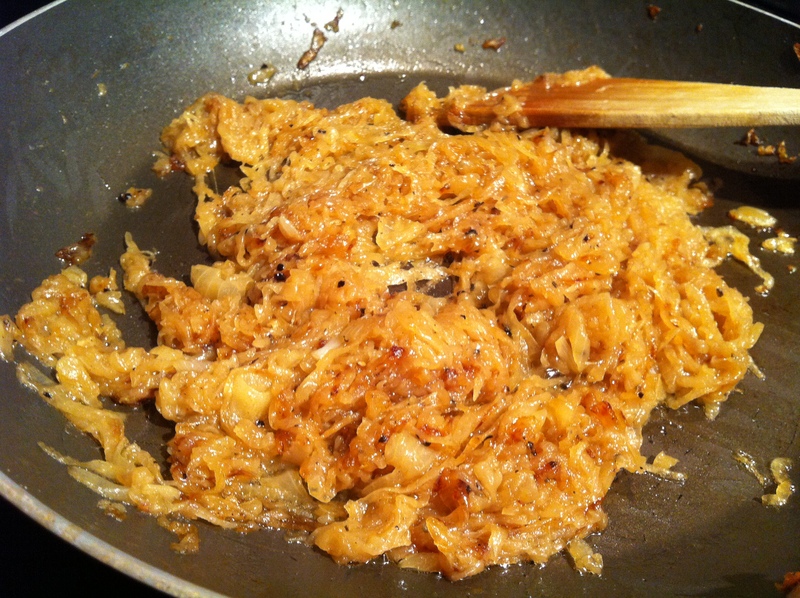 The main point is to combine everything but also to chop up the oats so that the mixture resembles a smooth batter. 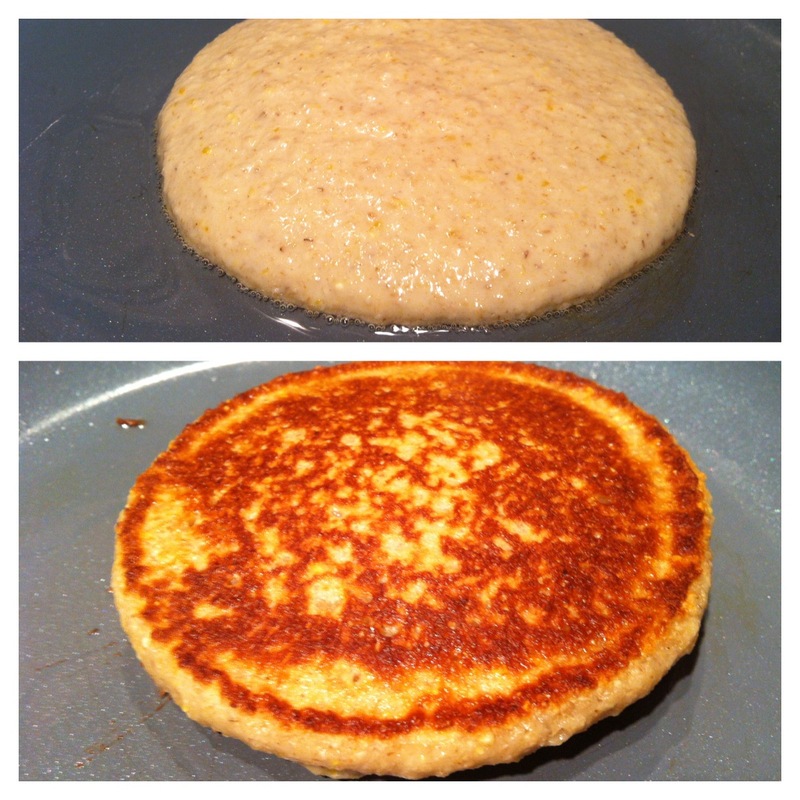 The best way to control for a runnier or thicker batter is to reduce or increase the almond milk. I made one pancake with less almond milk and it was good, but different. Very thick and had a tougher muffin-like texture. See picture below. Once it’s blended to your desired consistency, get a skillet warming on the stove over medium heat. To prevent sticking, I use a dab of the coconut oil and rub it around the skillet with my fingers (before it gets hot, of course). Spray oil would be fine, but I recently read that these can contain dangerous chemicals. If you read the ingredients on most of them, you’ll see “propellant” listed. The manufacturers don’t disclose what this propellant is (WTF, FDA? ), but a study showed that it is usually isobutane or propane. All set with using grill fuel in my pancakes. I’ve heard there are air-powered oil misters too, which are totally safe. Annnnyway, whatever floats your boat. From here, proceed as you would with normal pancakes. Once the skillet is hot, pour the batter into the pan. Wait for a few bubbles to form (2 minutes or so) and then flip, finishing up for about 1 minute on the other side. Then just stack ’em and serve. One thing to note. If you have extra batter, go ahead and make the pancakes and save them after they’re cooked. Baking powder is most effective right after it’s combined with other ingredients — this ensures fluffier pancakes. I topped mine with a small pat of butter (oops) and more agave nectar. I’ve been using this a lot because by volume, it’s twice as sweet as corn syrup, not processed the way white sugars are, and it’s main selling point: it has a very low glycemic index, meaning it won’t have a jolting effect on your blood sugar levels. It’s really tasty too! Superbowl Sunday is 2 days away! GO PATS! I’m going to make this post quick, but this recipe is one that I truly consider to be tested-and-true. I’ve made these a bunch of times with minor adjustments all along the way, and I think I finally nailed it. Really hope you guys like ’em. 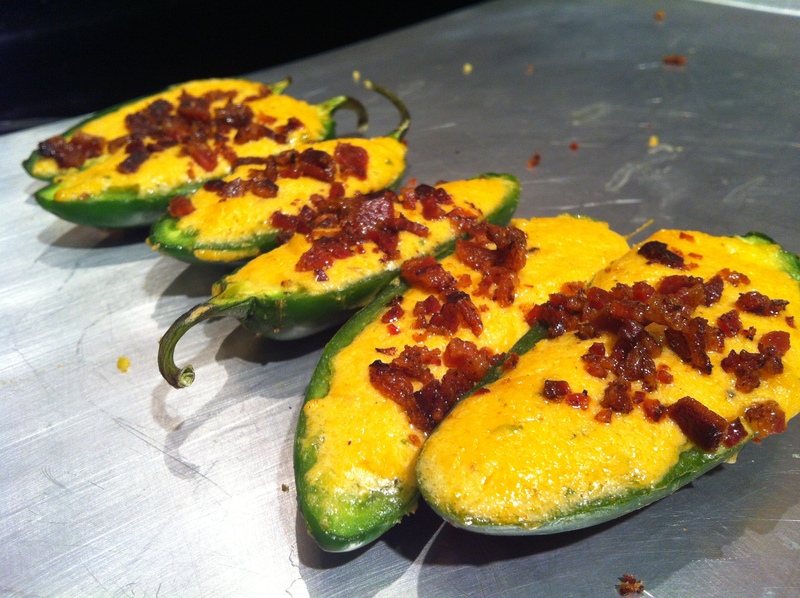 Perfect for those of us who love fried jalapeño poppers. 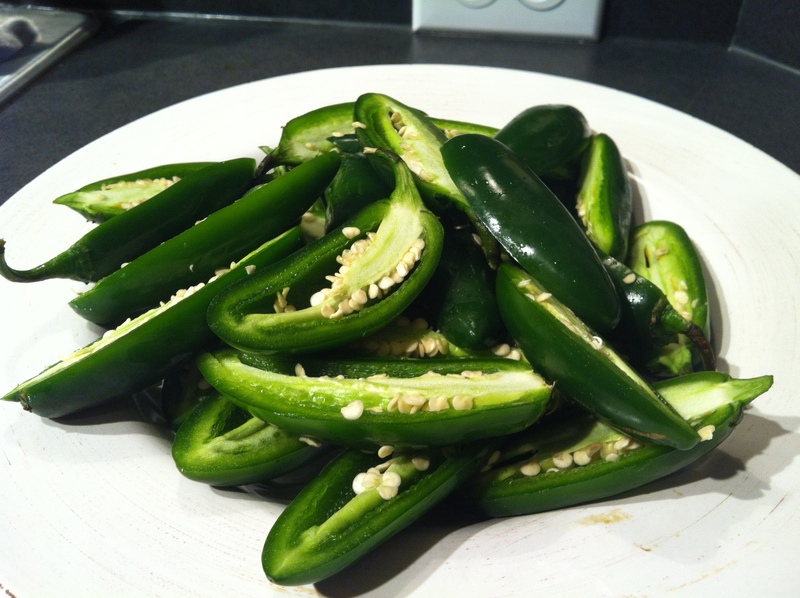 Start with about 14-16 extra large jalapeños (about 3 – 4″ in length). Wash them, dry them, and slice them in half length-wise. I leave the stem on as an “eating handle,” but if it pops off or was without one in the first place, no trouble at all. Or remove them if you want. Jalapeños, seeds and ribs removed. Now, use a regular teaspoon to remove seeds and ribs…just scrape down the inside of the pepper, but do be careful enough to keep the pepper intact. This is a bit labor intensive, but I have to admit I find it fun. Plus, as you get the hang of it, you’ll become faster and more efficient. Fry up some bacon…about 7 or 8 slices. Cook it ’til it’s at your preferred done-ness (mine is very crispy) and let it cool. Once you can touch it without burning yourself, chop it into crumble-sized bits. 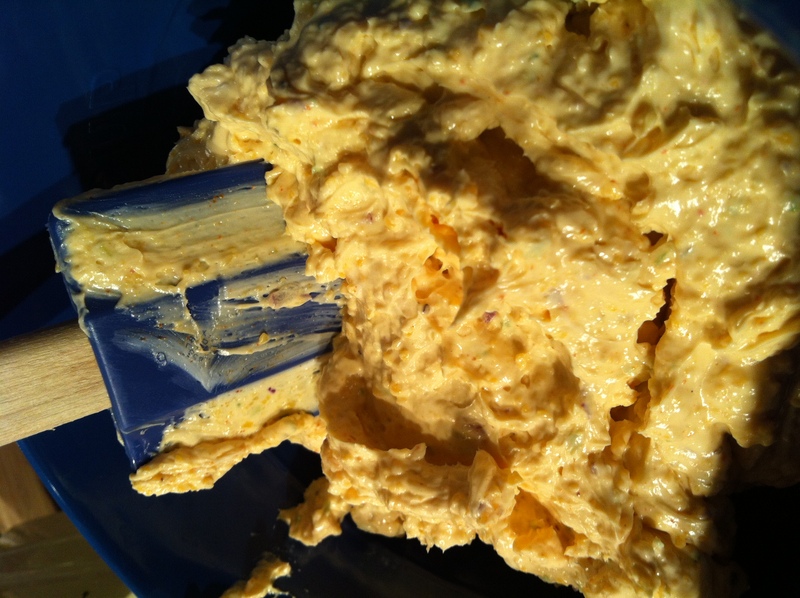 Next, throw the following in the food processor: one block of cream cheese, one block of orange cheddar cheese that has been shredded (most food processors have a grating attachment — makes it almost effortless! ), 2 scallions (chopped roughly), one clove of garlic (chopped roughly), salt, and pepper. That’s the basic filling right there, but usually I take it a few steps further with some paprika, cayenne pepper, Worcestershire sauce, and a little red onion. Throw in some hot sauce too, or whatever else you like. Many different spices/herbs would be delicious in here. 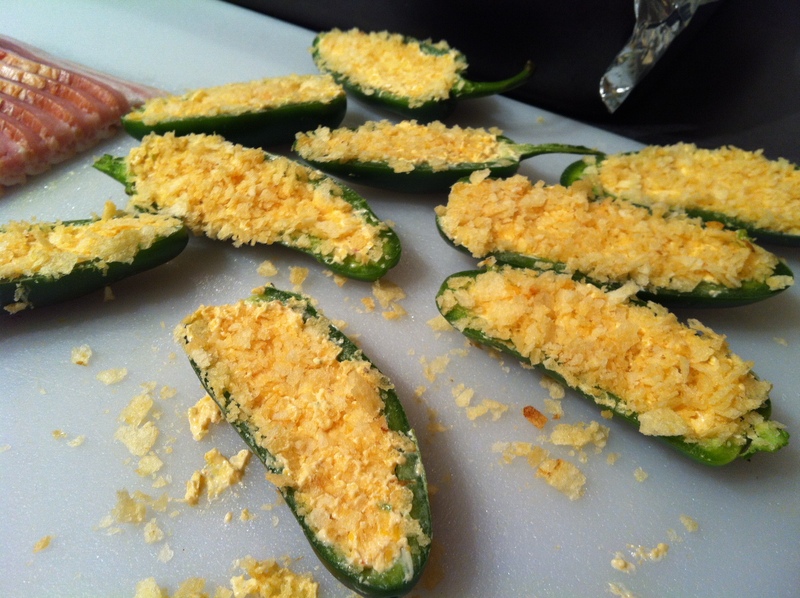 I also thought about adding some blue cheese crumbles…mmmm. Pulse it until it’s all combined. You want to make sure the garlic/scallion/onion is all blended through the mixture. It’ll be about 30 seconds of spinning. Spoon the cheesy mixture into the jalapeños. 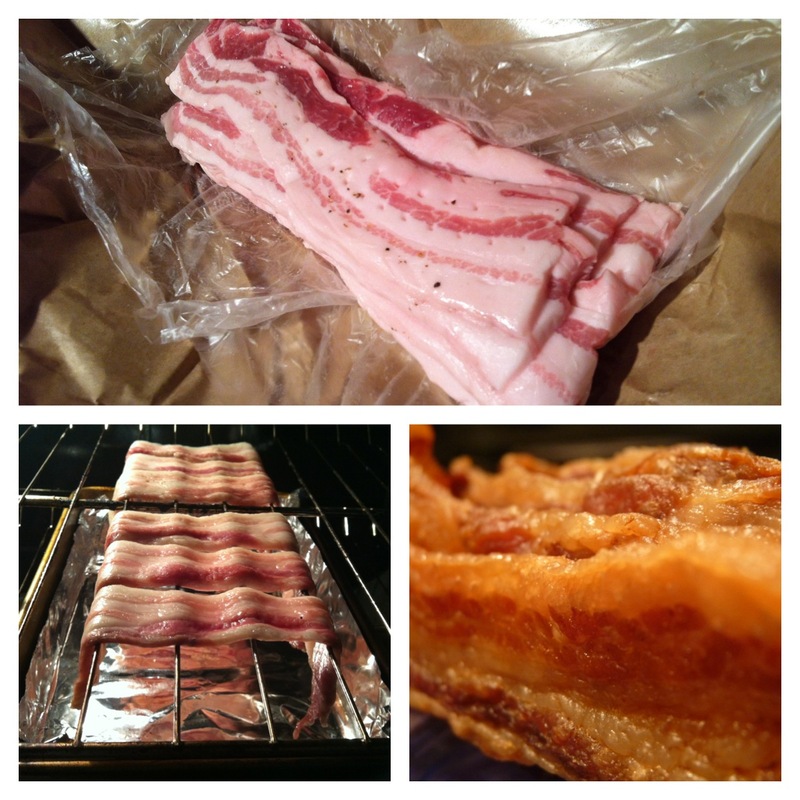 Sprinkle with the bacon crumbles and bake for about 10 minutes at 400°. YUM! I like to make a dipping sauce too, and at this point, assuming you have a little cheese filling left, you’re halfway there. Take the remaining cheese filling, a good heaping scoop or two of sour cream, and the same amount of salsa, and throw all back in the food processor. Blend it up and add a little more salt and pepper. Done! Sauce with a bit of chopped cilantro on top. These, to me, are the ultimate football food. Believe it or not, even if you’re not a spice person, you’ll be able to handle them. 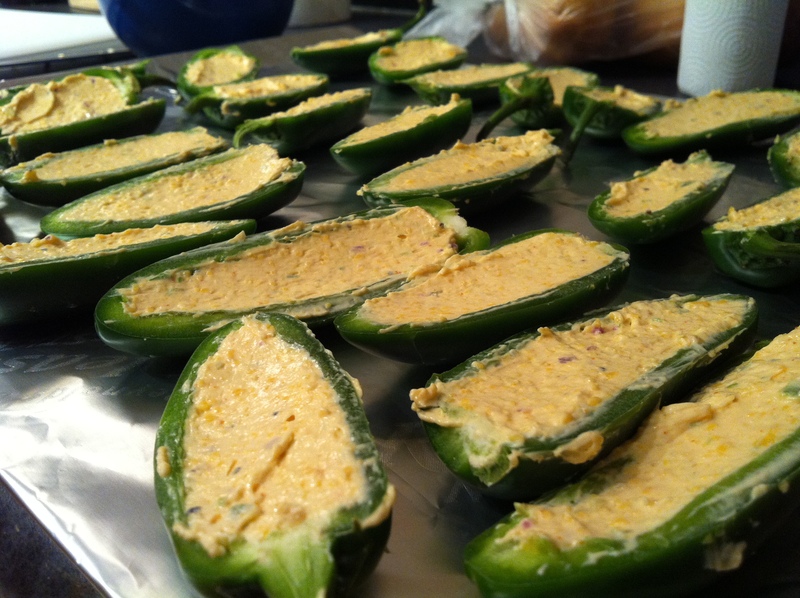 I’m not sure if bigger jalapeños are less spicy, if the heat bakes it out, or if the cheese filling mutes it, but really, the only thing that will burn are your hands from touching the raw peppers. Probably a good idea to wear gloves. 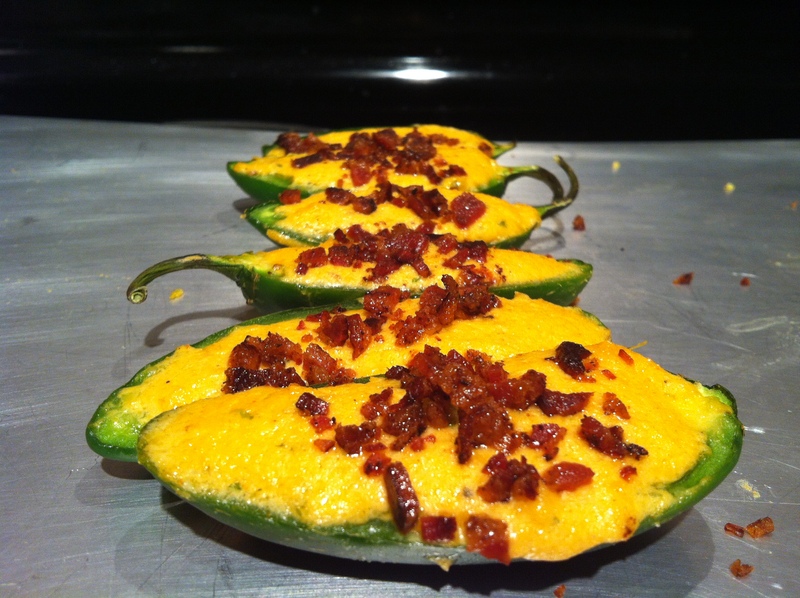 I’ve also done these vegetarian, using crushed potato chips or corn chips in place of the bacon. Delicious, but of course, not quite the same. Greasy Chinese (or any Asian cuisine) takeout is one of my all-time favorite treats. I love all of the dishes in the same order that they’re bad for me, the worst ones, of course, being my favorite. General Tso’s chicken, sesame beef and broccoli, curries, Peking ravioli, hot and sour soup, crab rangoon (though I’ve only maybe once eaten one of these with actual crab in it), any kind of crispy (read: ‘fried’) spring roll or dumpling…YUM! Other than the oil, salt, and sugar many dishes are laden with, the spice factor is one of my favorite parts — it adds the perfect extra dimension to the heaviness of these favorites. Mexican cuisine is my favorite go-to, something I’m always in the mood for. My relationship with Asian cuisine is slightly different, in that I’m not constantly craving it, but when I do, watch out — I’ve GOT to have it. 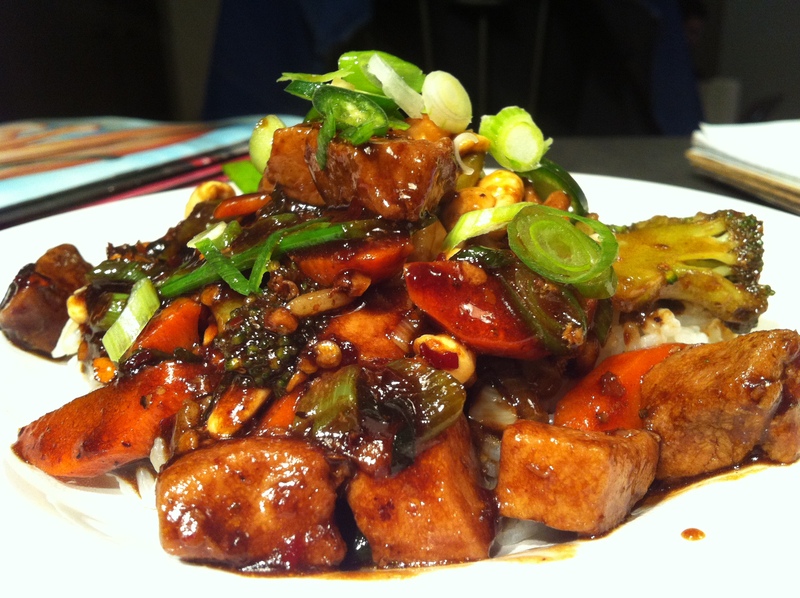 Most members of my family are passionate about food and cooking, and my Aunt Susie is no exception — this is a very slight twist on her incredible stir-fry recipe. The first time I tried it, I was instantly hooked. It’s seriously perfect — you get that same satisfaction of take out — all of the hot, sweet, sour, savory flavors, but you can control everything that goes in and therefore tailor it to your exact taste. The sauce is the key to this recipe and really, every ingredient in it can be increased or decreased, or eliminated all together (or add more components!). I’ve posted the measurements that I use, but go nuts…it’s simple and everything in the dish can be interchanged. My favorite combo of meat and veggie for this stir-fry is broccoli and chicken. Auntie’s is asparagus and chicken. Kyle suggested I throw in carrots and snow peas along with the broccoli, and it was excellent. Go in any direction here — onions, peppers, bamboo shoots — you really can get creative. Begin with some boneless, skinless chicken breasts. One large breast is plenty to feed two hungry people. Cut the chicken into bite-sized pieces. 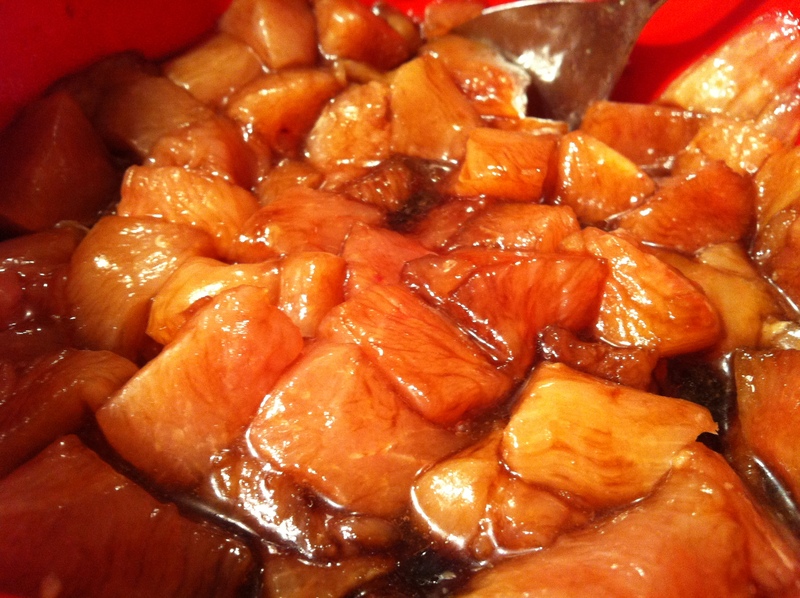 Throw the pieces in a bowl and sprinkle liberally with soy sauce and sesame oil. Mix around so all pieces are coated and let this sit while you prep the other ingredients. 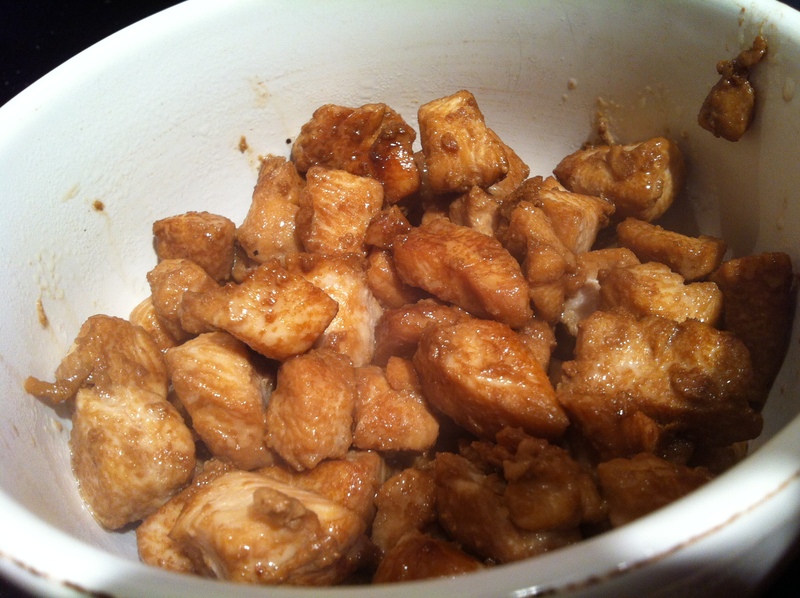 The chicken pieces with a little soy sauce and sesame oil. The sesame oil will also help the chicken pieces from sticking to each other when thrown into the hot pan. Now, cut up your veggies of choice. Again, bite-sized pieces are ideal. Along with the veggies you’ll also want to finely chop a big clove of garlic and a good chunk of fresh ginger (in size equal to the clove of garlic or bigger). For garnish later, slice a few scallions, and if you’re into spice, a Serrano pepper or two. For the sauce, I add all of the ingredients to a Mason jar and just shake it up. So easy! Throw in the garlic and ginger you just chopped, chicken stock, soy sauce, black bean/garlic sauce (easy to find in any grocery store in the international foods aisle), sesame oil, brown sugar, a splash of water, and cornstarch (this is the magic ingredient that will turn the cloudy, runny mixture into a thick, shiny, glaze-like sauce — reminiscent of, but better than, what you’ll find in takeout Chinese dishes). There’s one final ingredient, but it’s not as accessible as the others. In fact, Aunt Susie sends this to me all the way from San Francisco, along with a few other sauces I became addicted to while living there. One of many great Chinese food restaurants in SF, called Henry’s Hunan, bottles their own chili flakes and fermented black beans in a spicy oil. It’s absolutely to die for. I have to ration mine at home because it’s such a commodity. I’ll bet you could find something similar — if not, fine to skip it, or just add some red chili flakes (the same kind you’d put on your pizza). Screw the top on and shake away. Done! Some of the sauce ingredients. I used water & bouillon paste in place of chicken stock. The jar on the left is the Hunan sauce -- mmmm. I’m told the key to stir-frying properly is to cook everything quickly over a very high heat. Kyle and I have been looking for a good wok but haven’t found one yet (at least not in our price range). This is the ideal way to cook a stir-fry, as all of the heat is concentrated to the bottom of the pan. Until I own a wok, I’ll use a cast iron skillet for its excellent even-heating properties. It also gives the ingredients a nice color. Get your pan super-hot and add some vegetable oil. Once this has heated up, throw in your chicken pieces. You want to make sure the chicken browns slightly, and there are a few tricks to this. First, the pan should be very, very hot. Second, make sure your chicken is in a single layer in the pan. If you have more than that, cook it in two batches, otherwise, it could steam before it sautés. My Dad is so good about this rule that he actually cooks each serving of stir-fry separately. I have the best memories of waiting for it to be my turn when Dad would cook this during my childhood years. 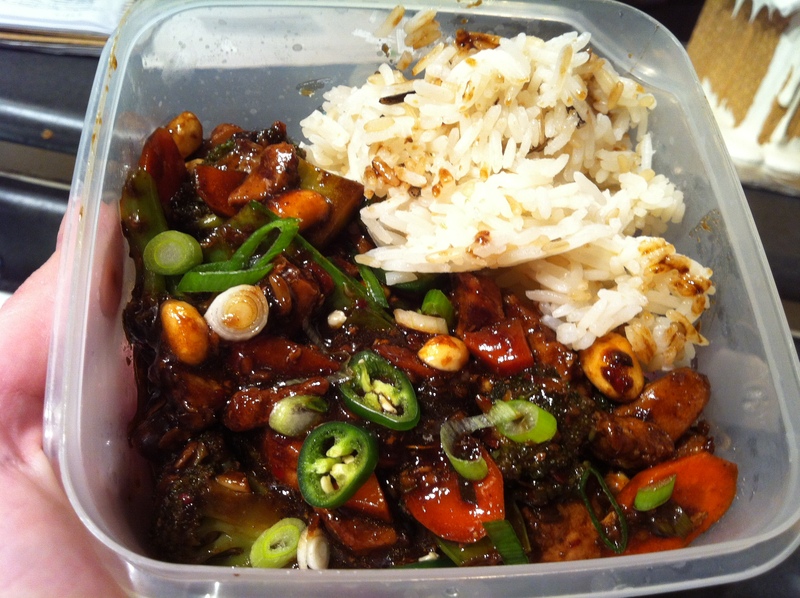 His is a Schezuan-style stir-fry and absolutely amazing — I’ll have to share that recipe sometime, too. Once you get the chicken in the pan, let it go a few minutes to really get some golden-brown color. Then, using a wooden spoon, stir it around to expose the raw sides of each piece to the pan. I’d say in total you’ll want to cook it for about 4 – 6 minutes, depending on the size of your chicken pieces. Once it’s done, dump it into a bowl and add a little more vegetable oil to your pan. Throw your veggies in and repeat the process — give them a minute or two to get some color and then stir. After 2 minutes or so, throw the chicken back into the pan and stir everything together. Now comes the fun part. Push all of the chicken and veggies to one side of the pan (leaving a good amount of open pan surface), or, if using a wok, take the veggies out and leave them aside with the chicken, so that you’re left with an empty wok. Grab your Mason jar and be sure to shake again, vigorously — the cornstarch likes to stick to the bottom. 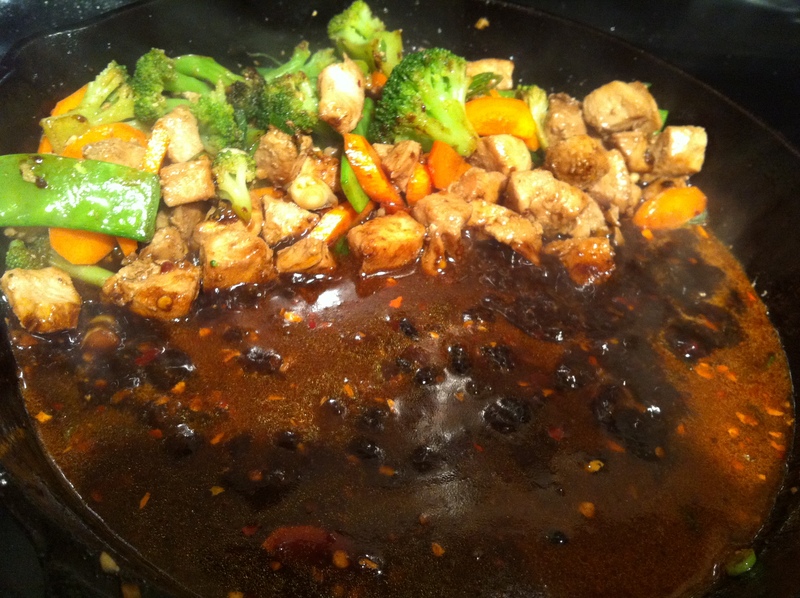 Once you’re confident everything is thoroughly mixed, pour your sauce mixture into the pan (still on high heat). Right before your eyes, the liquid will begin to bubble and become dark and glossy. 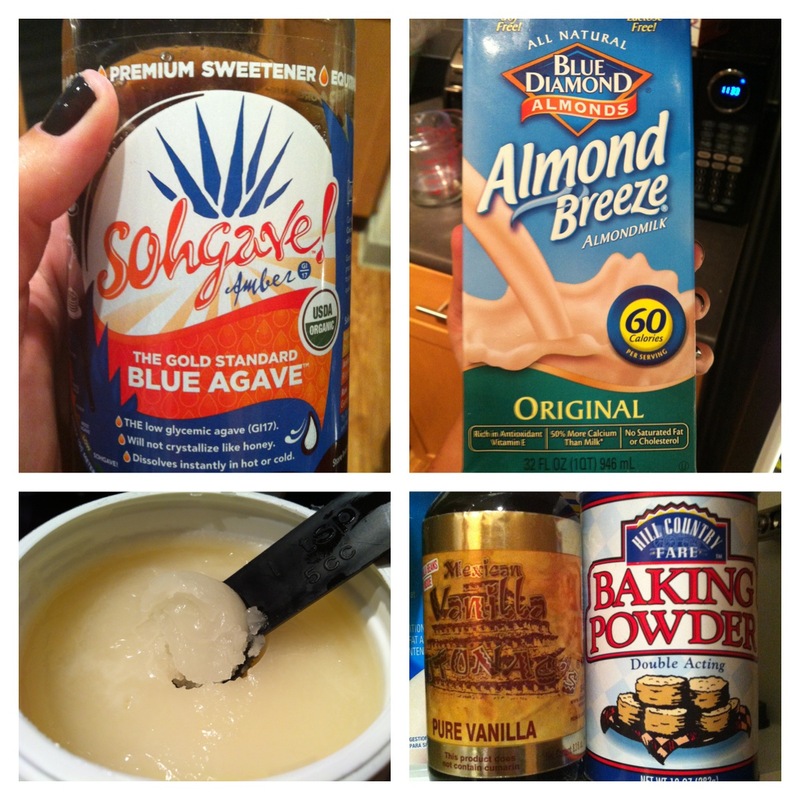 Mix as it bubbles with a wooden spoon to keep it moving and to avoid super hot patches that could burn the sugar. Once all of the sauce has pulled together (about a minute) push the veggies and chicken into it and stir to coat everything (if using wok, dump all ingredients back in and stir to combine). Let everything reheat through and combine for a good minute or so. Sauce poured into pan. On the upper right, you can see how the sauce changes completely as it comes to temperature. Serve immediately over rice or noodles. Although I prefer noodles over rice in general, rice is ideal here for soaking up all of the delicious sauce. Either way works though. I’d love to hear more winning meat/veggie combos, so please do share! Hope you guys love this, and thank you a million times to my talented Auntie for this recipe and for bringing a little bit of San Francisco into my kitchen via sauce and stir-fry! I love her. Happy 2012, everyone! While I do realize many a New Year’s resolution revolves around healthier eating and cutting back on high-calorie favorites, I might remind you that it’s still football season — the perfect loophole! Which means it’s most certainly acceptable to be eating junk at least once a week. I save my official “cheat day” for Sunday, as this is my favorite time of the week to be permanently parked on the couch (other than the occasional, or if you’re in your 20s, frequent, trip to the fridge for a cold beverage) enjoying delicious treats. One of my favorite ways to eat on a Sunday is to prepare, along with all three of my talented, food-loving roommates, several different tapas-style, ‘bar food’-like snacks. This way, we all get a chance to experiment in the kitchen and everyone gets to try a little bit of everything. The idea for this mini-recipe came to me a few years ago when a good friend and life-long Brooklyn resident (who also happens to be my best friend’s boyfriend) circulated an article amongst our burger-loving friends reviewing the Black Label burger at Minetta Tavern in NYC — considered by many to be the best in Manhattan. The chef was describing the lone topping he dressed this burger with — sliced onions that were given several hours to break down into the perfect, jam-like consistency over very low heat. Brilliant! Now, as much as I love to be in the kitchen, a few hours for onions sounded a little extreme for your average at-home cook. A $26 burger deserves nothing less, but I have the Patriots to watch and beer to drink. So I found a way to imitate what I imagined these onions tasted like. Hopefully someday I’ll have the opportunity to taste this burger myself! 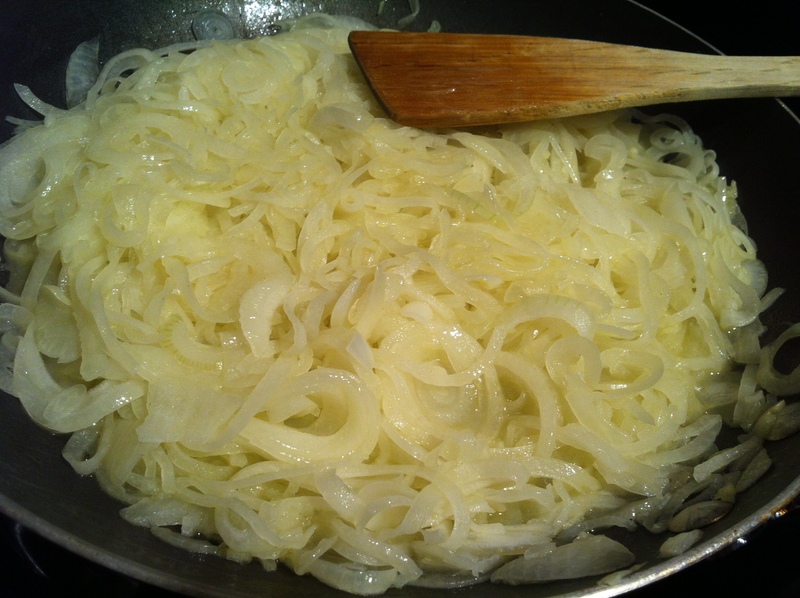 It still takes a bit of time, but the onions are well-behaved and can take care of themselves for the majority of their cooking time. I hope you’ll love these as much as I do! 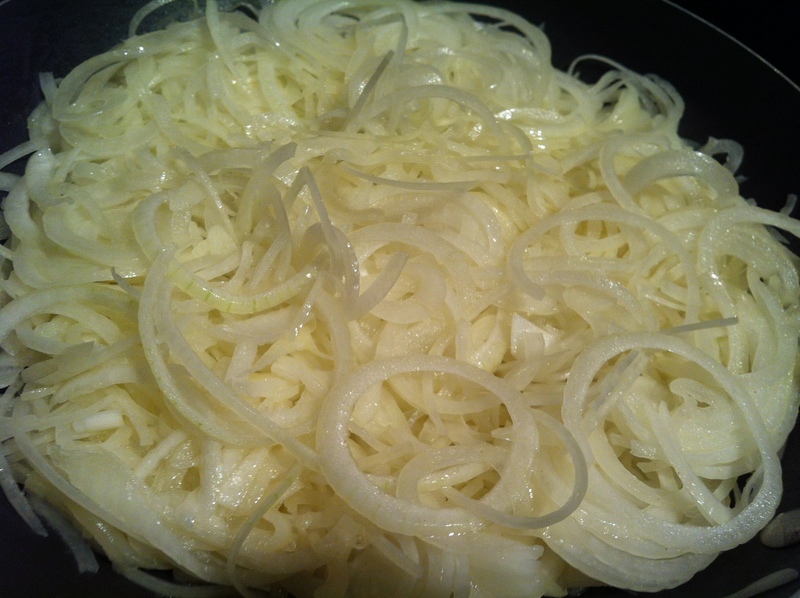 Begin with some white or yellow onions. I generally buy a bag of small- to medium-sized white onions, but I think any onion will do. 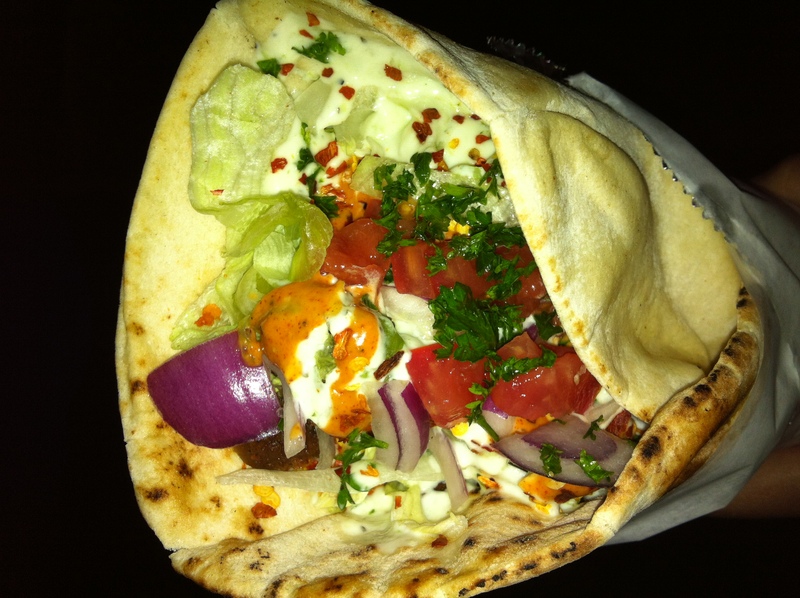 Red onion would work fine as well. 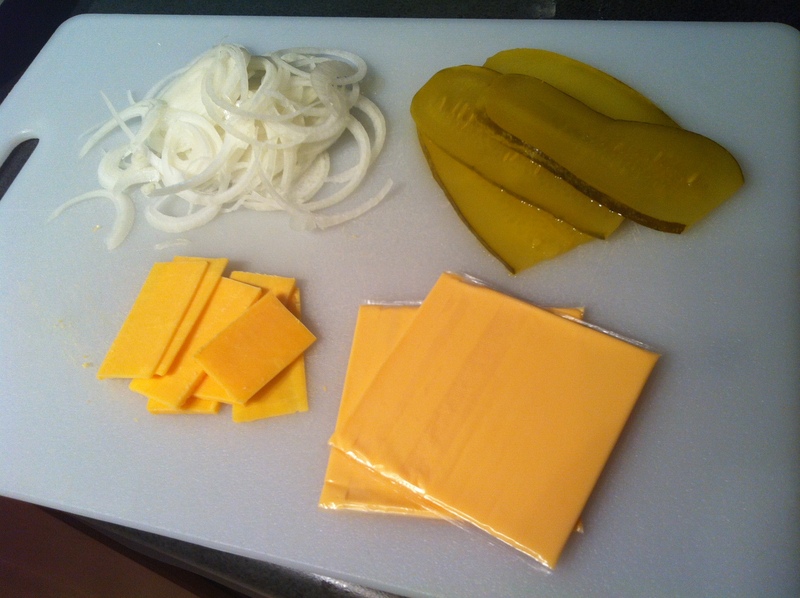 I used four this time, and while the onions cook down a lot, it was still plenty for an appetizer for four people. 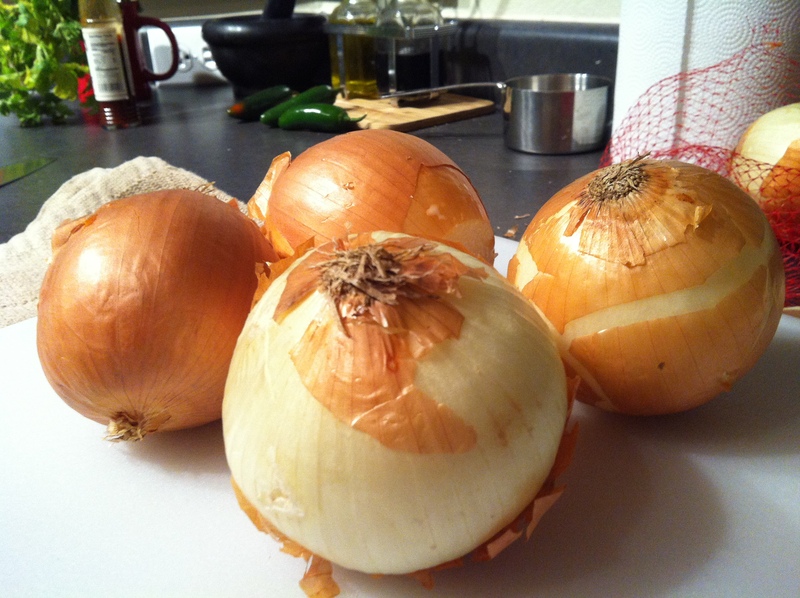 Cut off the tops and bottoms of each onion and remove the papery skin. I purchased an awesome mandolin at HEB (Texas’s biggest food market chain; sort of a hybrid of Stop & Shop, Costco, and Walmart) for $7, and for this recipe alone, it was worth it. Perfect uniform slices every time, though the same task can be done with a good, sharp knife. You want to cut through the onion in the direction that will give you rings. If you don’t have a mandolin, just do the best you can to keep the slices uniform. An eighth of an inch is a perfect width. 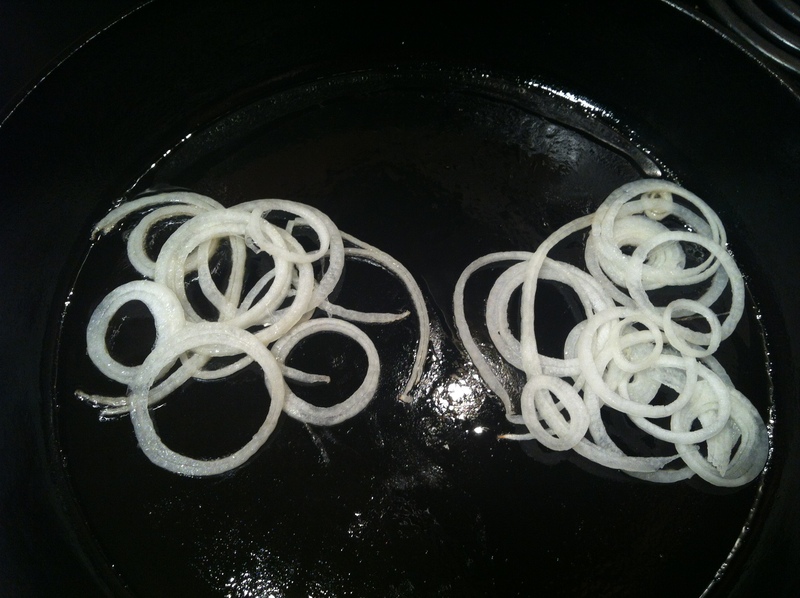 Once you have all of your onions sliced, get a large skillet over low-medium heat. As much as I love cast iron, this is an instance where non-stick is going to save you a lot of time later. This is because onions are very sugary (we’ll be making them even more so), and the cast iron skillets in our house aren’t old or seasoned enough to ensure perfect onion removal (though they’re getting there, slowly but surely). Also, the dark metal will get too hot too quickly and brown the onions a little quicker than we’d like. Add olive oil and butter to the warming pan. I did equal parts of both. 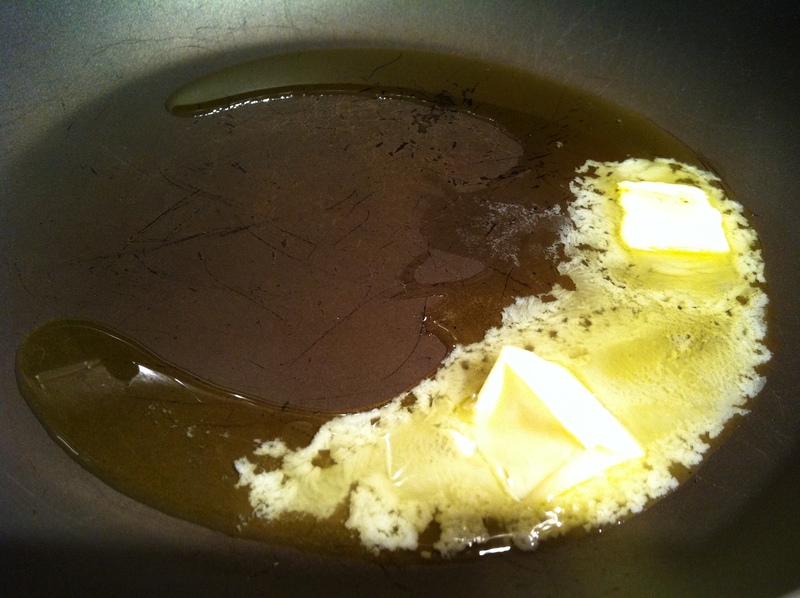 You could also use all butter or all olive (or vegetable, canola, peanut) oil. I find about half of a tablespoon of fat per onion is about right. 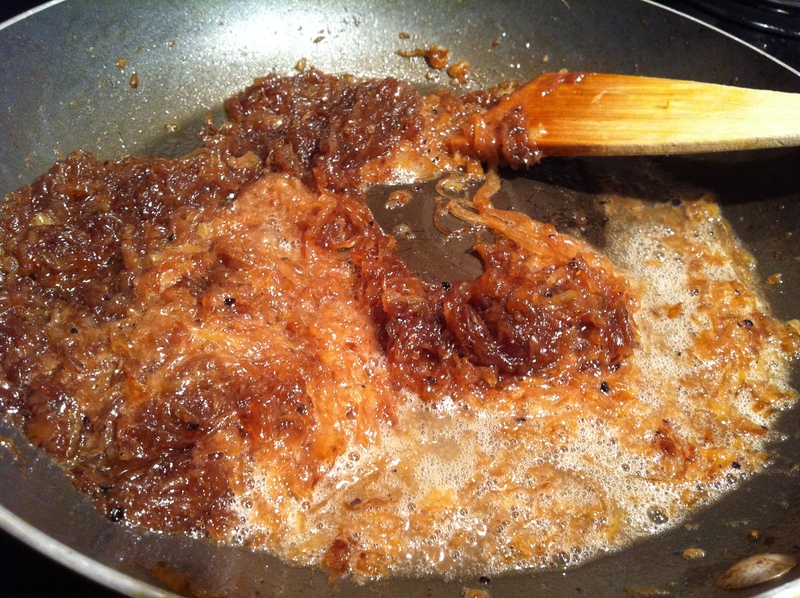 Once the butter is melted, add all of the onions to the pan, and stir, doing your best to coat each piece of onion in the butter/oil mixture. Now, the waiting begins. I let the onions sit on the stove top, leaving the heat at medium-low (about 3 out of 10 according to our stove top knobs). I came back to stir them every 6 minutes or so. Or you can try tossing them the way fancy chefs do. I gave this up after half a batch ended up on the burner. I’ll stick to my trusty wooden spoon. As time goes on, the onions will go from translucent to yellow to golden to amber to caramel-colored. 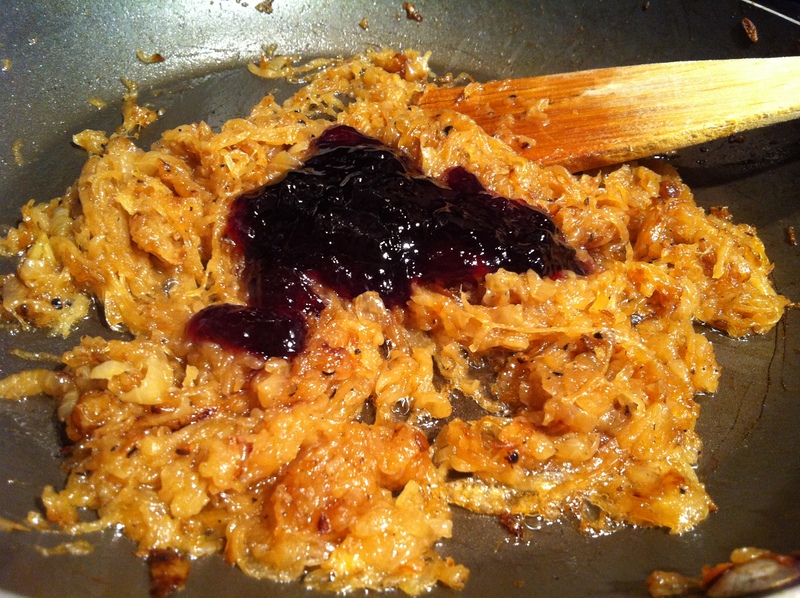 After about 40-45 minutes (this may vary) of cooking time, it’s time to add the secret ingredient – a generous dollop of grape jelly! Yum. Or raspberry. Or apricot. I can’t think of any kind of fruit preserve that wouldn’t be delicious in these. 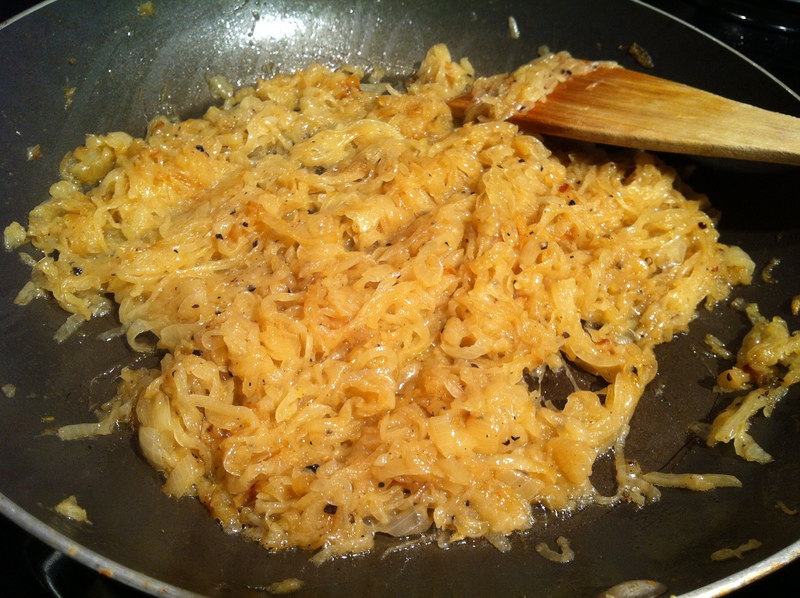 The sticky jelly acts as a perfect binder to pull the onions together into an almost sauce-like consistency. Funnily enough, in the finished product you can’t necessarily pick up the taste of the fruit; the ingredients just become a perfect synergy. Along with the jelly, sprinkle in brown sugar. 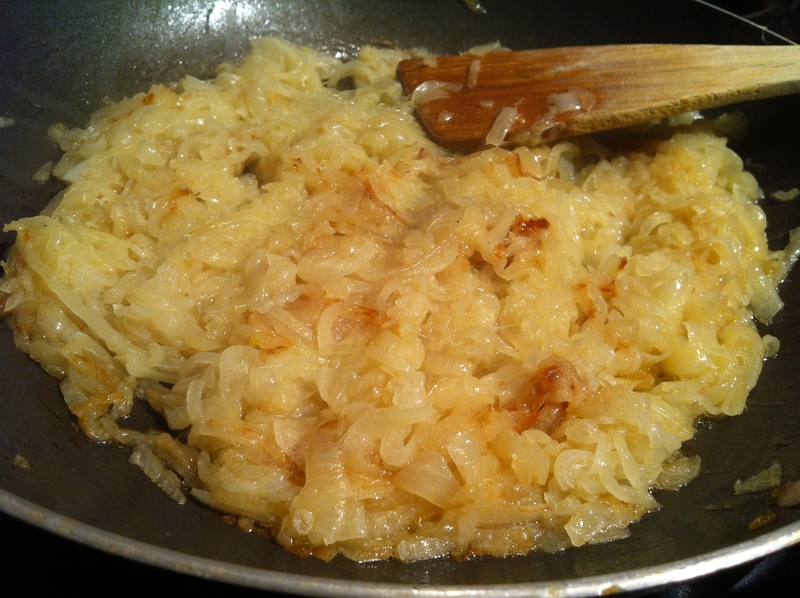 Adding additional sugar to the onions helps to speed up the caramelization process — something I learned from another one of my best friend’s mom, who has some serious tricks in the kitchen…she makes the best chocolate chip cookies I’ve ever had. One time she even shared her recipe, taught me the exact process, step-by-step, and mine still don’t come close to hers. That’s true kitchen magic in my opinion. Now’s also the time to season with some salt and fresh-ground black pepper. White pepper would be awesome here, so as not to mess with the pretty color of the onions, but I didn’t have any. No biggie, probably wouldn’t make a huge difference in the end anyway — they end up pretty dark in color. Continue to cook down about another 10 minutes. Now, add a sprinkling of each balsamic vinegar and lemon juice, and mix. 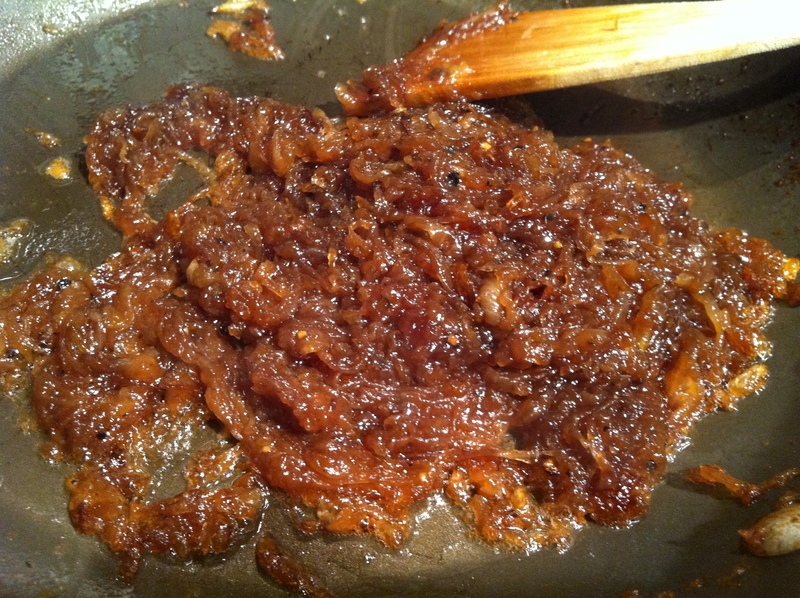 The onions at this point should be very reduced, tangled, and a deep toffee color. Finally, deglaze your pan with a good splash of wine — red, white, rosé, anything. They say only cook with a wine that you’d drink. Luckily this isn’t a problem for me because I’ve yet to meet a wine I don’t like. Since I was making these on New Year’s Day, we happened to have some champagne left over from the night prior’s festivities — perfect. Stir everything around and cook down another 5 minutes or so to burn off most of the liquid from the wine. And…done! These will go great on all kinds of things. Some of my favorite applications — pizza (I often add a little garlic and extra oil at the end, then use them in place of tomato sauce), calzones, sandwiches (pastrami, turkey, grilled cheese! ), burgers (with Swiss cheese and bacon), over hot Italian sausages with grainy mustard. Also from here you could add beef broth and you’d pretty much have a classic, from-scratch French onion soup. This day, however, being in finger-food mode, I served them as a simple appetizer over a wedge of room-temperature Brie. 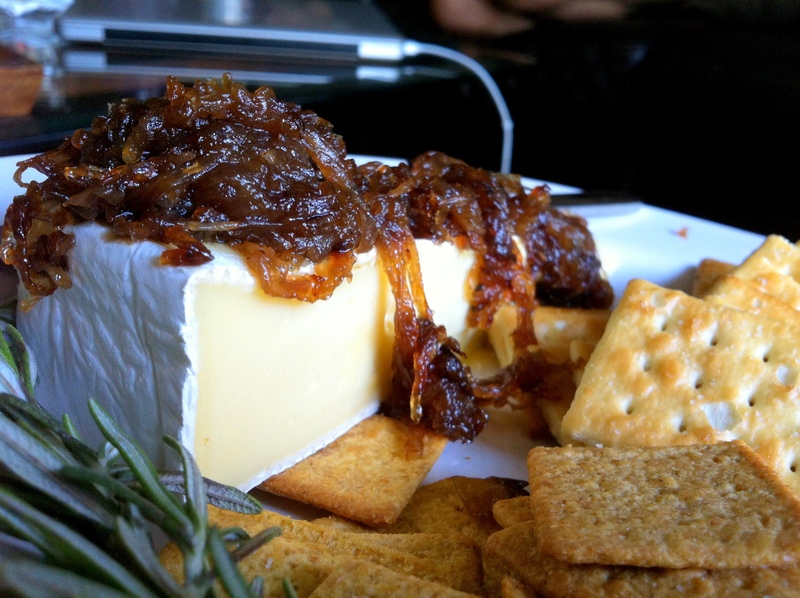 Perfect yin/yang situation…the buttery, creamy Brie became slightly melty and balanced great with the syrupy sweet, tangy onions. Cheddar or goat cheese would be fantastic as well. 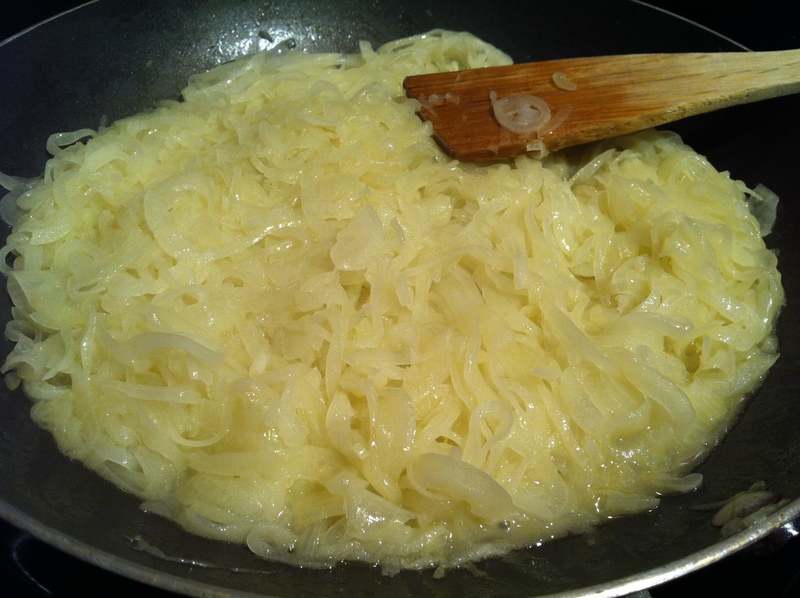 Just spoon the warm onions over the cheese and serve with crackers. Or if you’ve got a little more energy than I did, cut a baguette into thin slices on a bias. Sprinkle with a little olive oil, salt, and pepper and bake on a sheet pan in a single layer for a few minutes at about 350°. One (optional) addition to the plate are a few sprigs of fresh rosemary. Tear up a few leaves onto each bite. Something about the woodsy-ness (yes, spellcheck, I know that’s not a word) adds the perfect finish, plus the green pine needle-looking herb makes the plate a little more aesthetically pleasing.